Girls today probably don’t really appreciate the women in the Olympics just as I didn’t really appreciate the fact that women in America only got the vote the year before my mother was born, 1920, 25 years before I was born. I keep going back to my own school years, the years when these Olympic athletes are starting their training. Each year the students begin their classes, all being rather stiff after a summer’s rest. After the first few gym classes with Mrs. K’s giving us exercises to do, we become stiffer than ever. We have learned that the exercises are good for warming up before games and they also help in good posture. 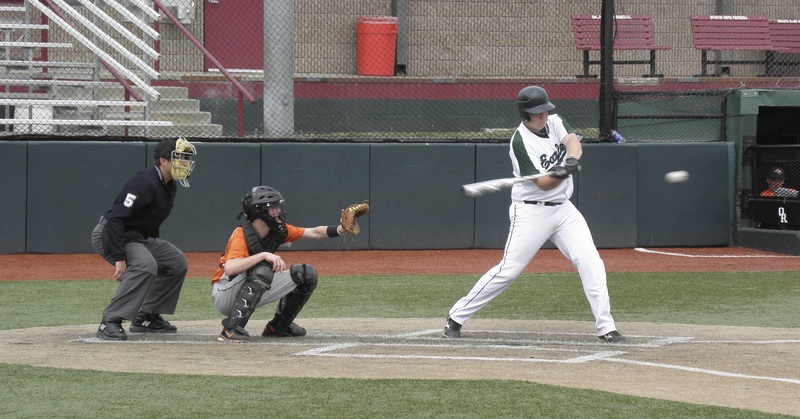 The students in the school were divided into two teams, who competed against each other during the year in baseball (softball), hockey (field hockey), soccer, and basketball. The rewards were the coveted Athletic and Play Day cups. On Play Day, they could participate in tennis, softball, volleyball, deck tennis, shuffleboard, badminton, table tennis, one hundred yard dash relay race, and the fifty yard relay race. They held swimming competition at the nearby Y.W.C.A. and competed in diving and swimming with speed and form the main factors. Here are the girls in their school uniforms displaying all the equipment of sports. At this time, when I was in fourth grade, I was participating in swimming and golf in the summer and games in gym class. That’s about all there was out there for us, although the school had a football team for the very few boys who attended the school. There were usually about six boys per class, so I guess there were enough to have two teams to play each other in 4th-6th grade. I didn’t think about it because we weren’t getting extensive coverage of the Olympics or other sports, mainly because we didn’t get much television coverage of anything. When I was little, the television stations came on, yes, they actually came on the air, about 4:00 in the afternoon and signed off with the national anthem followed by a test pattern about 10:00 at night. Not much room for sports programming there. We listened to baseball on the radio or read the newspapers for scores. Not much to obsess about as far as sports were concerned. By the time I left the private school to enter 7th grade at a large junior-senior high public school, not much had changed. In gym class, we swam in a hot pool wearing ugly tank suits and bathing caps, learning the strokes but not racing. There was a synchronized swimming group, but I can’t remember if they competed with other schools or swam for fun. 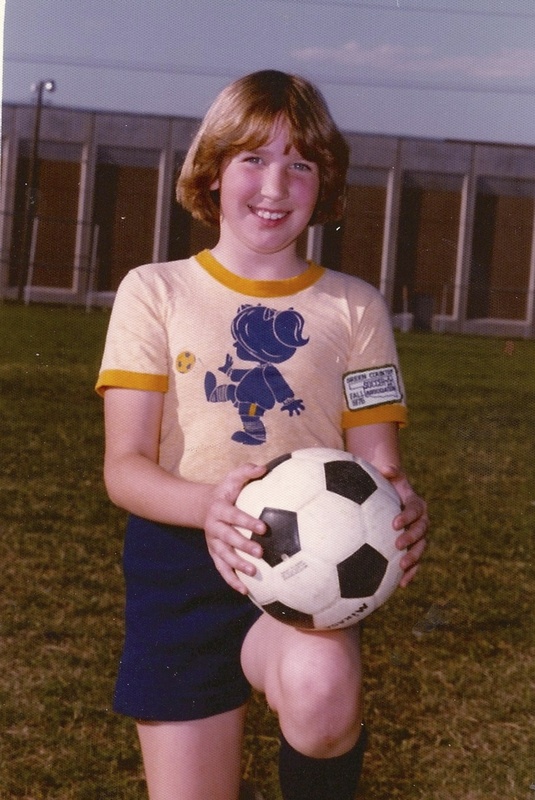 In gym class, from 7th grade through high school, I remember folk dancing, exercise sessions (think jumping jacks and sit ups), interpretive dance, basketball, volleyball, and games. I’m sure there were more, but I can’t remember. And we wore these charming gym suits, purchased at Sears where they would also embroider your name. This was a big public school in a city with many big high schools and there were no sports for girls. I actually won a letter in basketball my senior year for intramural basketball, which makes me laugh to this day. That was about it. 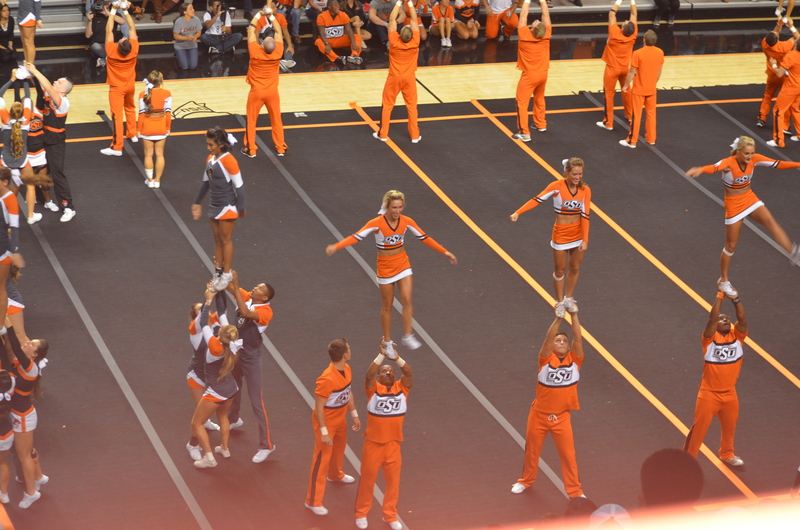 There was cheerleading, but who thought that was a sport or even athletic? I checked my high school yearbook, Class of 1963, and found 27 pages of boys’ sports and one page for the girls. You will note there are three photos and one of them is of boys. I think this makes my point. 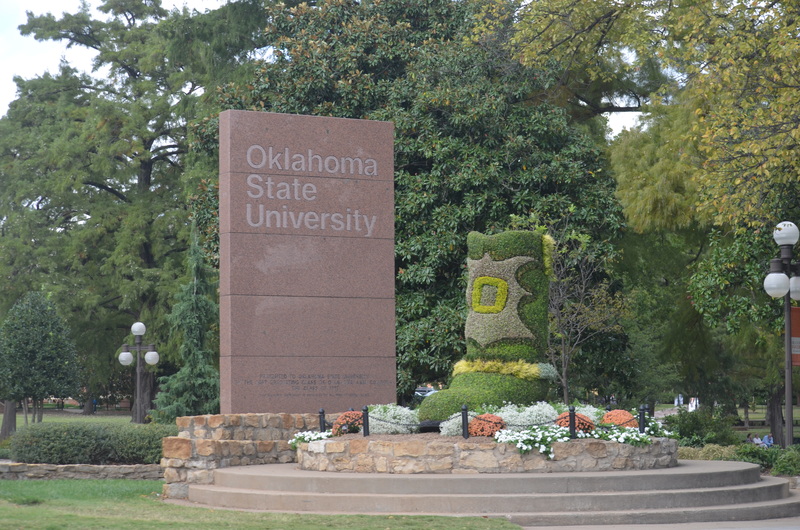 After high school, I attended Oklahoma State University, where I was required to take four semesters of gym. I took Golf (which I had played since I was 9, although not taking it seriously and only competing in small tournaments), Badminton (which I had played in the back yard forever), Archery & Riflery (which was fun except we used the ROTC rifles and they were very heavy) and a class called Body Mechanics (back to jumping jacks and sit ups). Easy As or Bs on my college transcript. Other options were Bowling, Tennis, and probably some others. Bowling was the most popular and the hardest to get into. After I finished my four semesters, I didn’t participate in any sports and don’t remember even intramurals or anything else for girls. We walked across campus in our skirts (another subject, since we were required to wear skirts regardless of the weather) and walked up a lot of stairs, so I guess that kept us in shape. I’ve tried to remember if there was anything going on I didn’t know about and couldn’t think of anything, so I once again pulled out my 1967 yearbook. 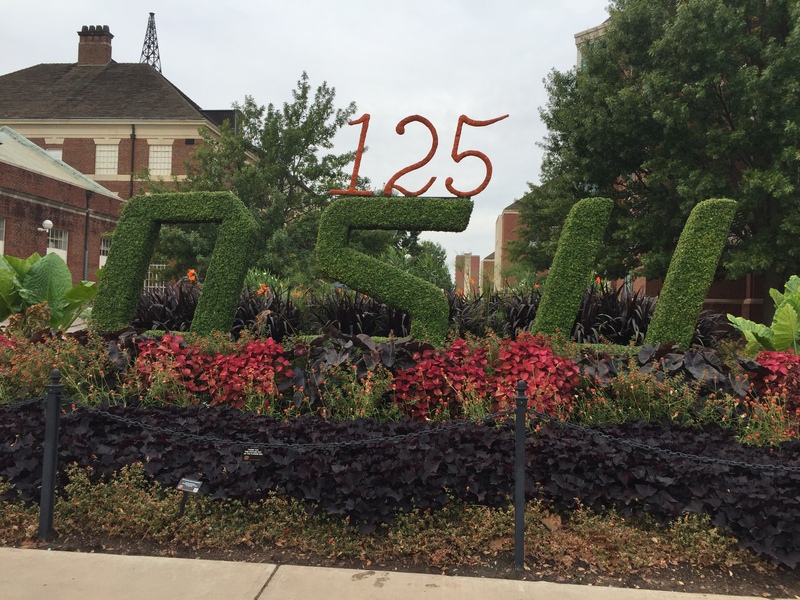 OSU was a large university and had nationally recognized teams in football, basketball, golf, wrestling, and other sports – for the guys. Once again, I found 25 pages of various men’s sports, 2 pages of men’s intramurals and one page for the women. At least all three photos are of women or coeds (is that term even used today? I hope not). In 1968, I became a mother to the oldest of my three daughters (a son followed, but this is about the girls). My second daughter was born in 1970 and the third in 1973. 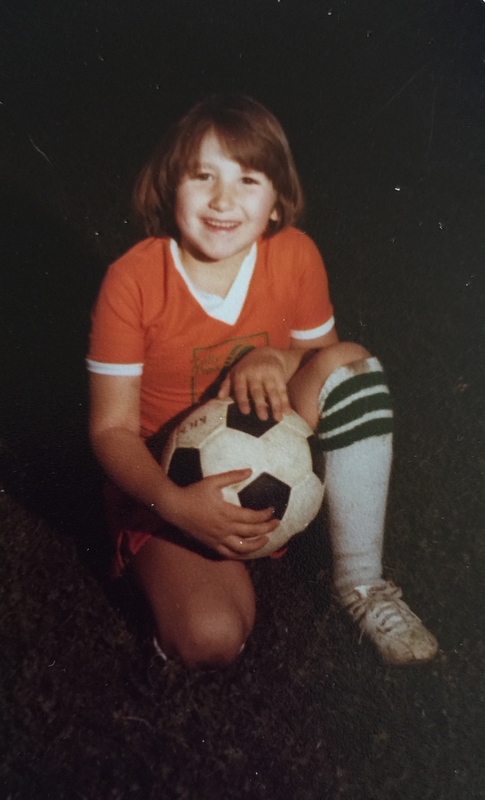 In 1972, Title IX became part of the Education laws and I was so busy having kids that I didn’t really pay attention to the changes that were about to happen. 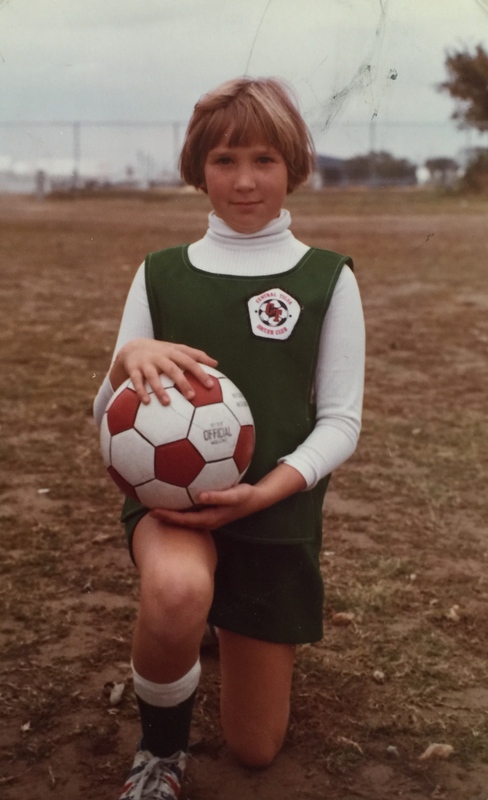 In 1976, when my two oldest girls were in Kindergarten and Second Grade, soccer was in its second year in Tulsa. It was a new thing to have a sport that girls could play, so I put both girls on a team. And so it began. All three played soccer for many years and the trophies were awarded when they were on winning teams (not like the participation trophies today) and I made sure they had tennis, golf and swimming lessons every summer. At one point, all four of my children were on a competitive swim team, winning many ribbons and medals. They were exposed to many sports in school and each girl played on at least one team in high school (track, tennis, softball, and soccer). My middle daughter received a partial soccer scholarship in college, when those scholarships were just beginning to be awarded to girls, and played well past college. During those years, there was more and more coverage of sports on television and the Olympics, both winter and summer, were anticipated, with more and more women’s sports being included. Our national interest and obsession became greater and more opportunities were out there for girls to participate. They didn’t just participate, but competed at higher and higher levels. For women my age, it’s been a long time coming. I don’t take it for granted that my almost fifteen year old granddaughter has been competing since she was little and is currently on the high school volleyball and soccer teams. My six year old granddaughter is just beginning to explore the sports out there. It isn’t important whether she likes them or wants to be on a team. It’s important that she has the opportunities she wants. Women have been competing in the Olympics for over 100 years, but it’s only been in the past 50 years that there have been so many choices for them to excel. As I watch the Olympics this year, I get an extra thrill when I watch girls of all races participate together, because there were also times when the races couldn’t compete against each other. Some sports were only for the privileged and now those are open to all. In my life, there have been so many changes. I loved my childhood, but I don’t think of those as the good old days, or times I want to return to. Women are running companies, running races and running for President. This is in addition to being homemakers, although the men are becoming bigger partners in this, as they should. Opening all these doors to women has actually opened more doors for men, also. During these current Olympics, as I read griping on social media about the slights to female athletes or complaining about the use of terms that are now becoming obsolete in describing women, I am thinking back to the times when these conversations weren’t even possible because we weren’t watching any women reach these spectacular heights. My perspective is from my lofty 70 years, but my perspective is also for all the girls I grew up with and for my girls and my granddaughters. My perspective is also for my mother and grandmothers and all the way back to when they couldn’t vote, much less be active in sports. I’m all for celebrating that we’re here today, men and women cheering the achievements of some absolutely stellar female athletes. 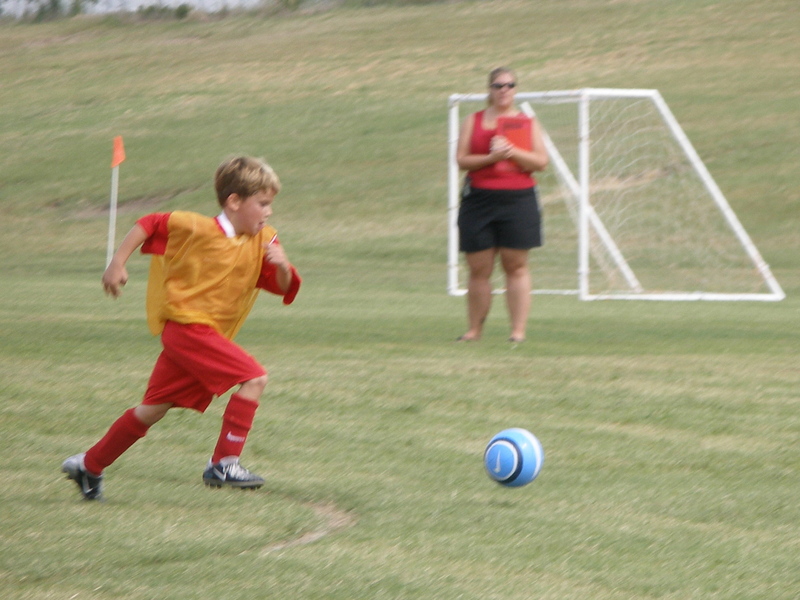 Last week, I watched my youngest grandchild play in her first soccer game. They had two practices and were ready to take on the game as only a bunch of kindergarteners can, not knowing what they didn’t know. The parents and grandparents had little expectation and it was all fun. When I later asked mine what her favorite part was, she said scoring the points. They didn’t score any, so that’s that. Here she is getting close to the action. She also played goalie for a quarter, which I think was maybe 5 minutes. As I was turning out of the park, I had a sudden memory flash. Wow! 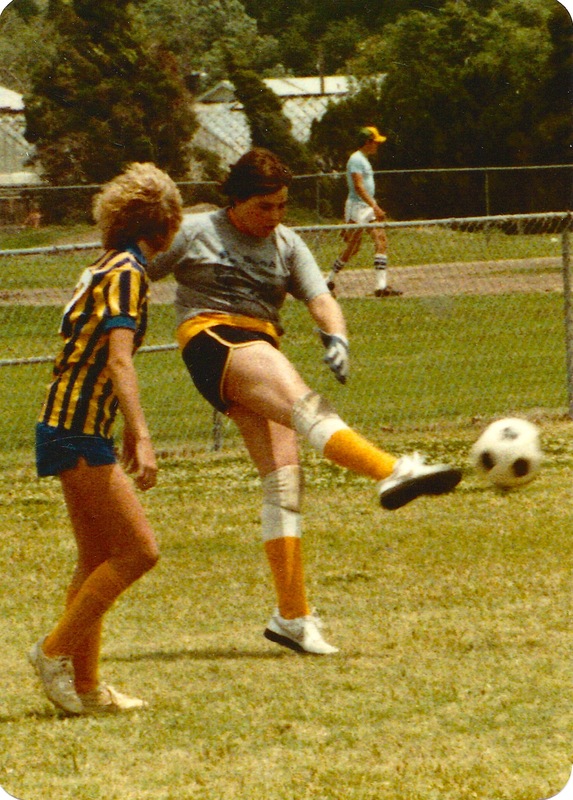 This was my, counting in my head, 12th child to watch play soccer, including my four children and my eight grandchildren. Wow. This was the first organized sport for all of them and the only organized sport they all played. Wow. I spent time processing this as I remembered so much. My oldest daughters started playing way back in the last century, back in 1976. Ancient times compared to the students I work with who were born in the late 199os. 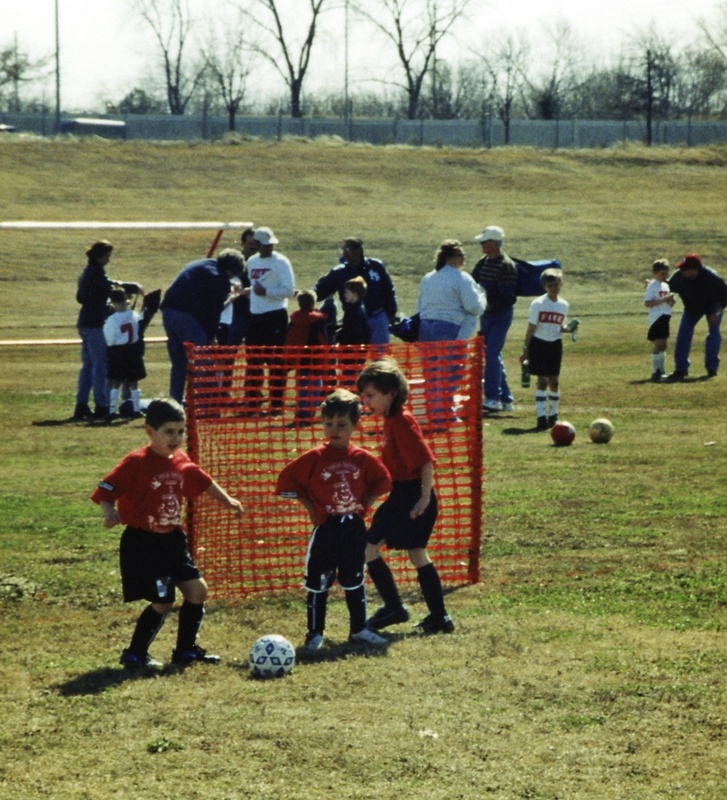 Soccer had been introduced to Tulsa the year before so none of us remembered or knew too much. Soccer was a game we played in gym class back in the 1950’s, or mid-century as it now referred to. Anyway, my two oldest daughters were in 2nd grade and kindergarten that first year and played on the same team, the Crickets. There were no places to buy uniforms so our clever coach either made little weskits for them to wear over a shirt with shorts or found them somewhere. I’m not even sure they had soccer shoes, but I remember shin guards. I guess someone lined the fields. We didn’t have fancy game chairs and the kids played on full size fields, so there was a whole lot of running involved. And clover picking. Not much yelling since nobody understood the rules yet. 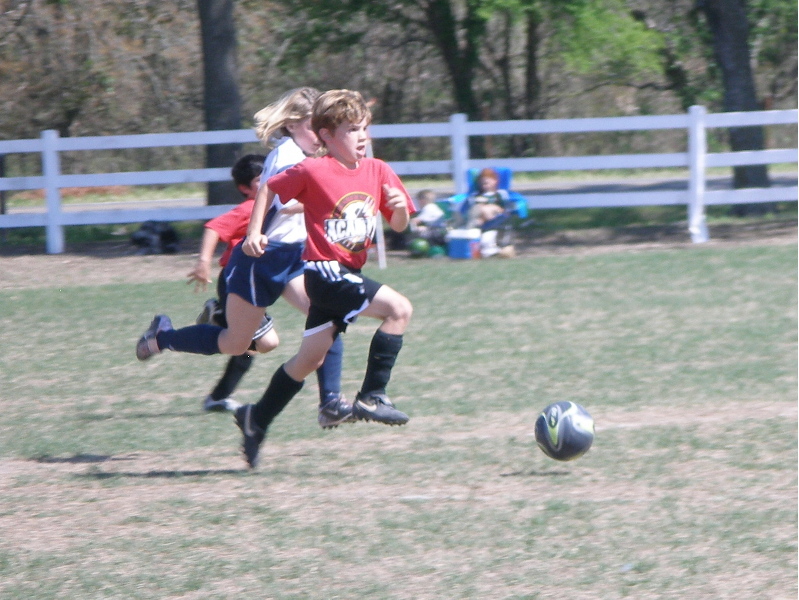 That was later…My oldest daughter went on to play soccer and tennis and swim competitively. She liked it, but sports weren’t her all-consuming love. She had fun teams, mostly with girly names. 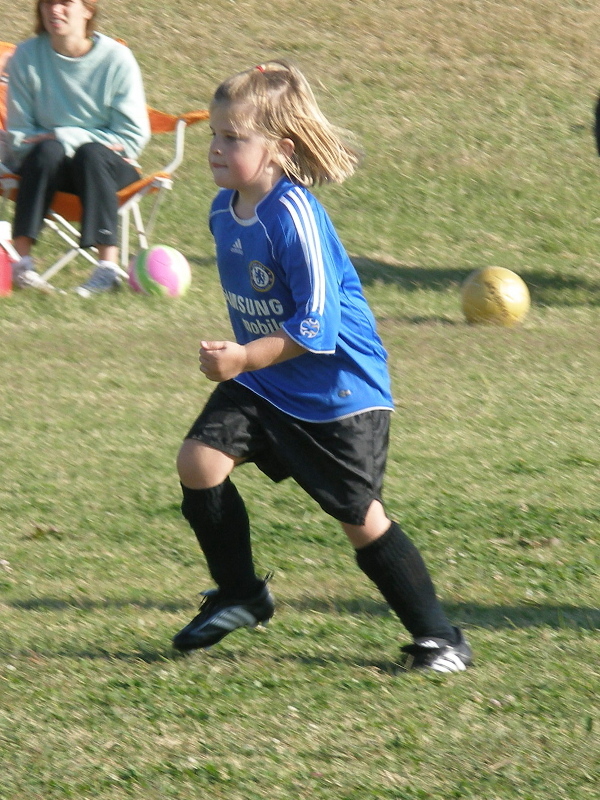 My second daughter took to soccer with a passion. Although she swam competitively and learned other sports, she played soccer as a goalie all the way through college, getting a partial scholarship at a time when schools were just starting to offer them. She played after college and played with injuries until she had to stop. Then she had kids and became their coach and coached others and became a soccer mom. She was definitely our soccer kid! Our third daughter started playing in 1978, when she was 5. Her first team was the Lollipops. She was later a Tiger and on other teams, and also swam competitively, but eventually took up softball and track in high school. She’s now a runner and has been in a couple of marathons. Our son started playing about 1980 when he was five. 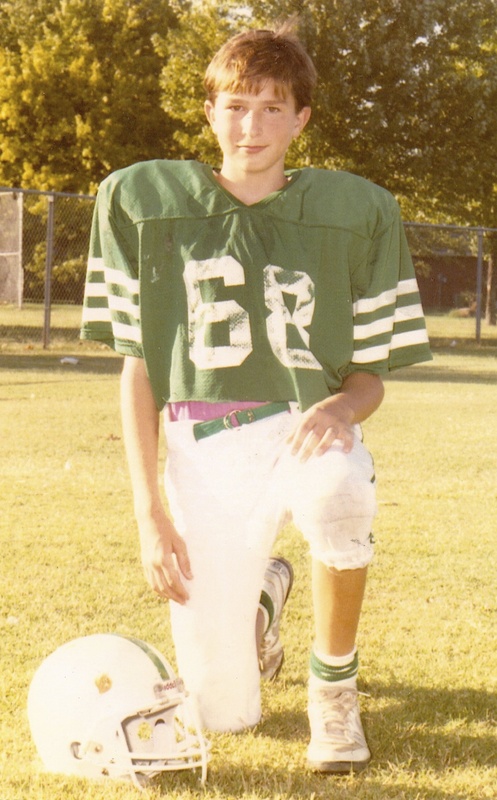 I don’t remember if this was his first team, but I love that my skinny boy was once an Incredible Hulk. He swam, although I wouldn’t say he was competitive, and played t-ball, basketball, football, and ran cross country. To be honest, he was better at art and comedy. When he died at the age of 35, one of his friends remembered him as the worst player on the soccer team, but the most fun. That was pretty much his story all along. He did win class elections, so there was a bit of competition in him! By the time we had grandkids, soccer was so established and was definitely still the place most kids started team sports. Now they could sometimes find teams when they were 3 or 4 years old playing on little fields. I think all of ours were at least 5 or in kindergarten, but they all started young. 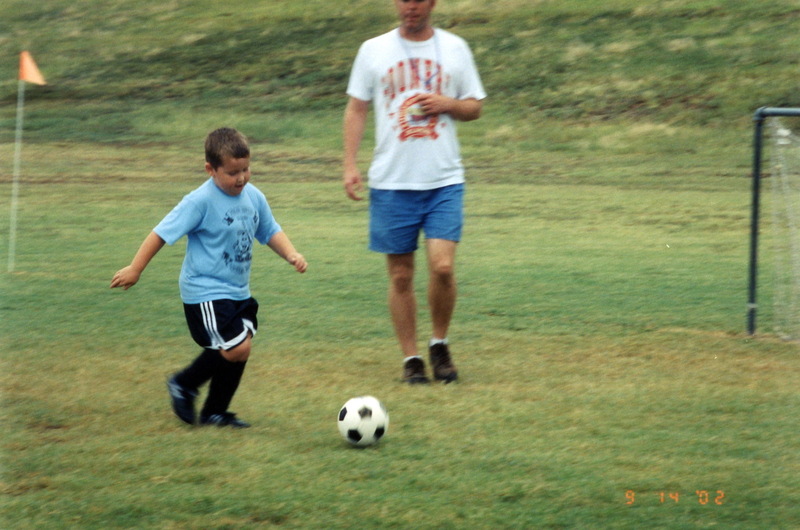 Our oldest, who is now a freshman in college, was a big kid and ready for sports. 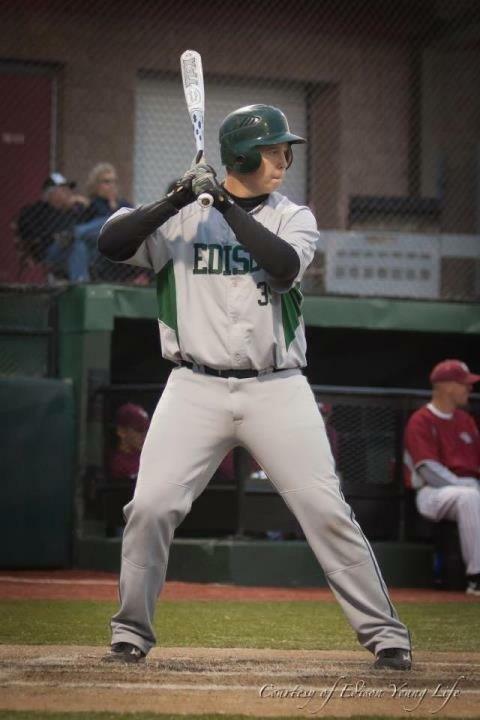 He played soccer for several years as well as baseball, basketball and football. Baseball was his favorite and he played through high school. Our first three grandsons were all born within 8 months of each other. The next two are graduating from high school next month. 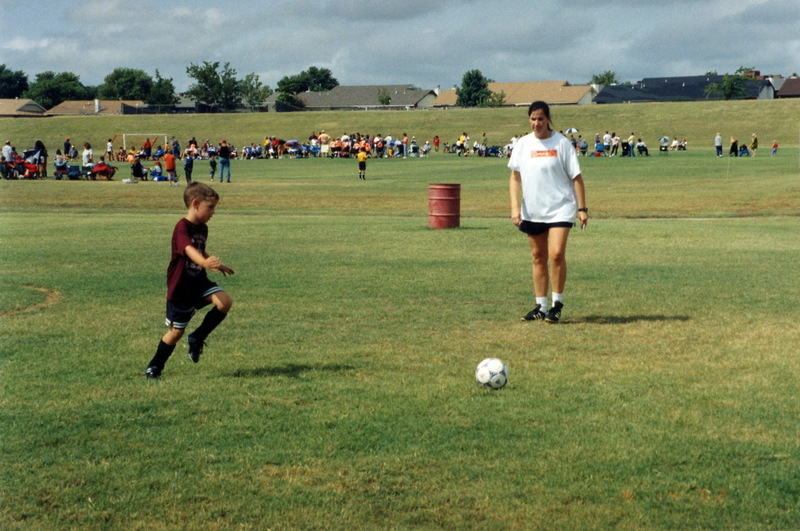 The second one is the son of my soccer playing second daughter, so he was on the field with Coach Mom. Guess what?! He’s almost 19 and still playing, although I think his years on the field are drawing to an end. Now 6’5″ he played basketball too, although he ended up in soccer, playing on a competitive team and the school varsity team. Note Coach Mom on the sideline here. 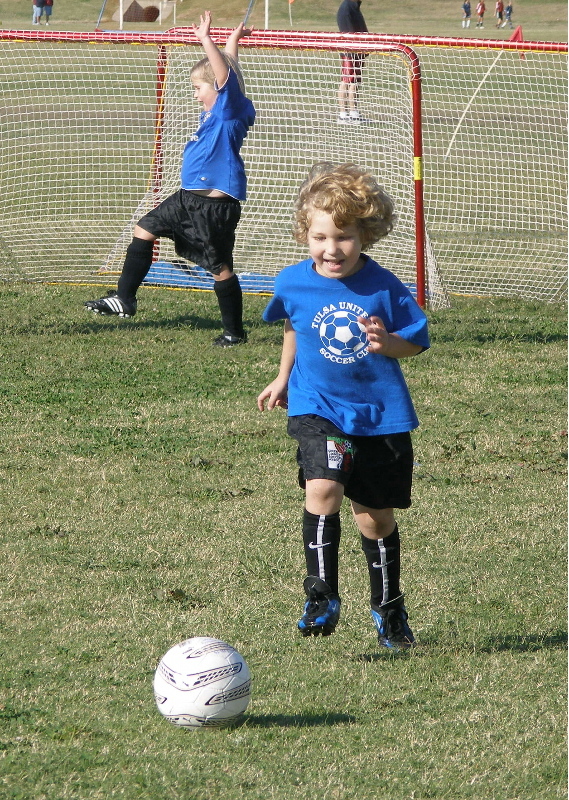 The third grandson started with soccer and t-ball and played soccer and baseball for many years. 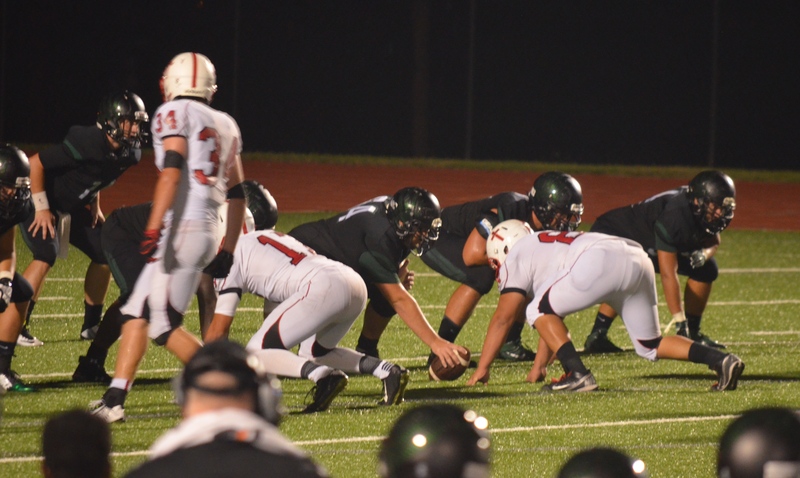 He found his calling in football by high school, ending his career last fall as the Center on the high school team. He’s into filmmaking and off to other things now. 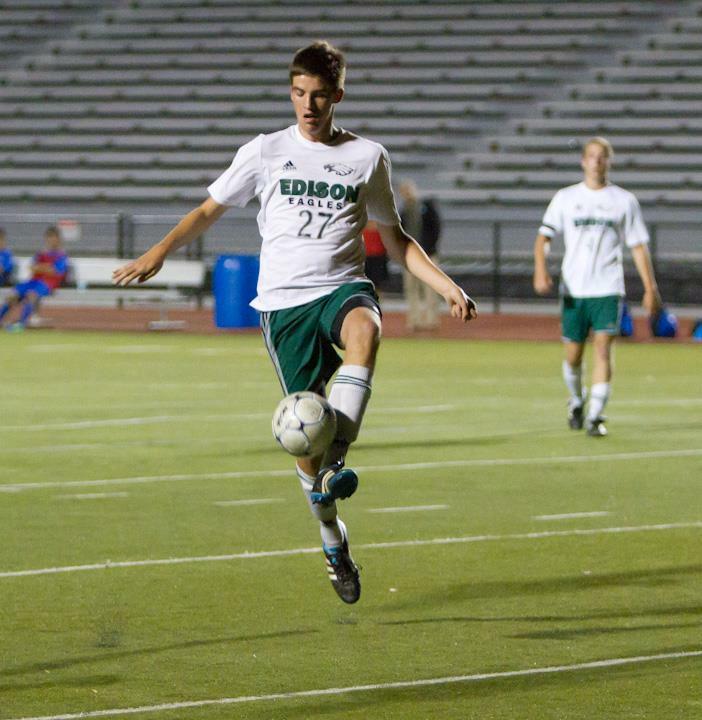 He’s about to kick the ball in this picture. You can’t imagine what a rush of blurred soccer memories this has brought back to me. Putting all these sports into the perspective of my life has been a trip of sorts. 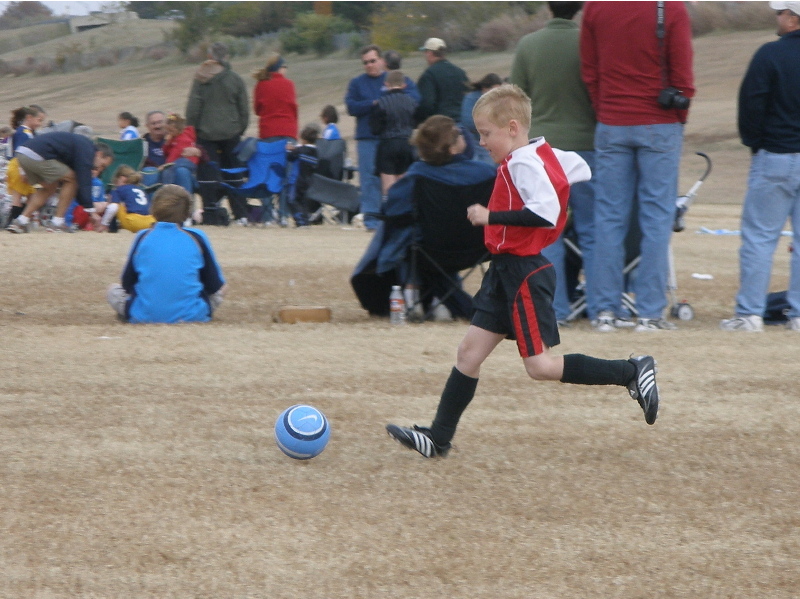 Now we’re to my fourth grandson, another son of my Soccer Mom, who played soccer, baseball and basketball until he settled on soccer, playing on competitive teams and the high school team with his brother. He’s grown almost as tall as his brother in the last year and will still be kicking for as long as he can! I’ll throw in this picture of him with Coach Mom, although I have to show one of him running. He still flies through the air at times. My fifth grandson is about 9 months younger than the fourth and they are in the same class. This guy is our biggest kid since birth, still growing at 16 and 6″5 1/2″. He started in soccer and played soccer, basketball and baseball for many years. He only wants to play baseball now as a sophomore in high school. In fact, that’s all he wants to do and plays on a competitive team and on the school team. Anyone need a tall pitcher/first baseman to play for them when he finishes school? 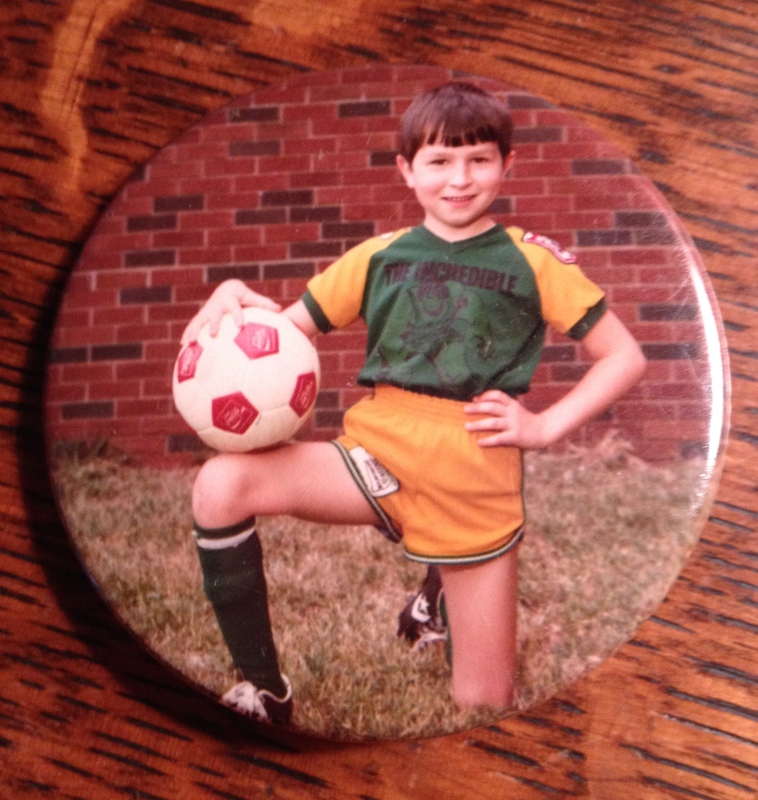 He started like the rest of them…with soccer. Whew! Are you keeping up with all of this? How many patches have I sewn on uniforms? How many soccer fields have I driven to? 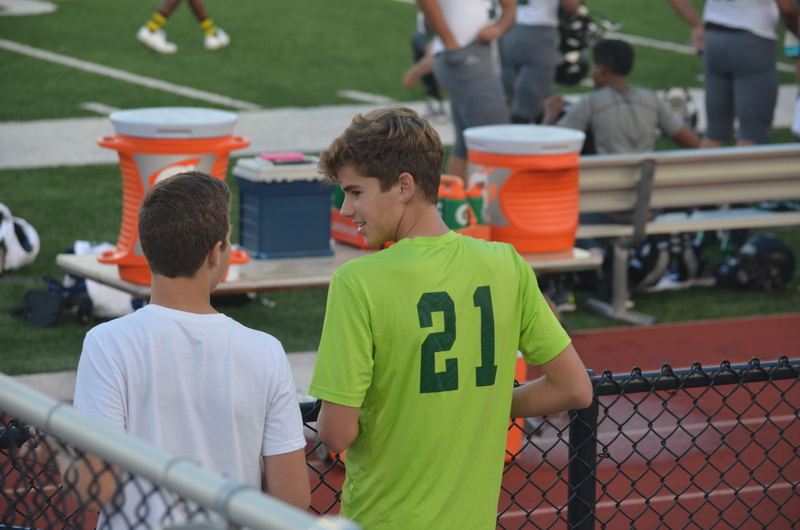 How many half-time bottles of water, orange slices, and after game snacks have I provided? When my kids were little, I had three or four playing at once and my husband had to work on Saturdays, so I drove a lot. Games on every side of town at the same time. The only time I wanted to scream was when I heard one of my daughters say I didn’t go to her games (she said this as an adult). Dang! I didn’t miss many! Really now. The next two grandkids are now in 8th grade, in the same class, at the same school as the rest. It’s a combo middle/high school where three of my children and three of my kids’ spouses graduated. The girl, the third child of my soccer mom daughter, is now playing soccer, basketball, volleyball, and, are you ready?, shot put on the track team. She’s the envy of her youngest cousin who now has trophies and medals in her eyes after seeing a picture of her idol with a medal around her neck and the team trophy awarded to her for her work as goal keeper. She was into it from the start. She’s only about 3 weeks older than her cousin, who is in the same class. 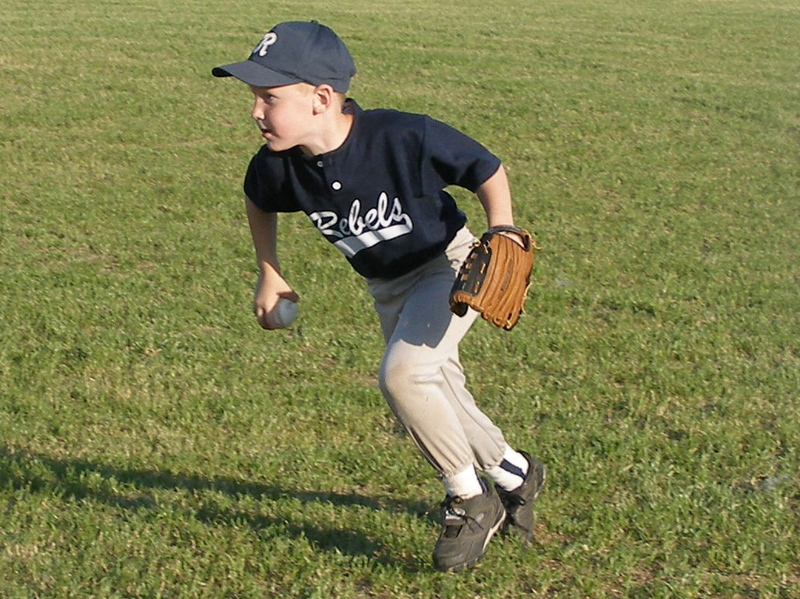 He started with soccer and has played baseball, basketball and football. 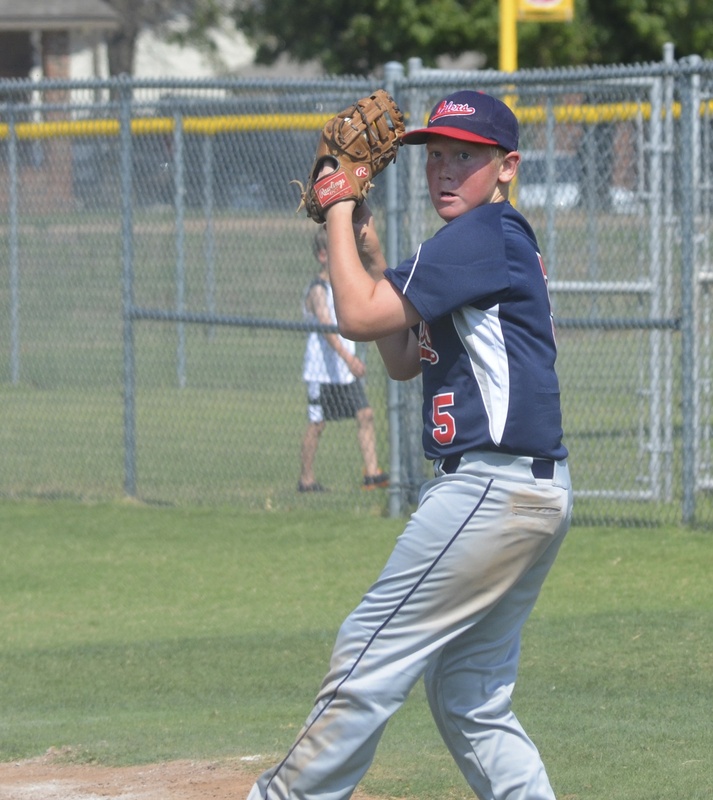 He’s now playing baseball most of the time on a competitive team. I guess he’ll go out for varsity baseball and play with his cousin next year. 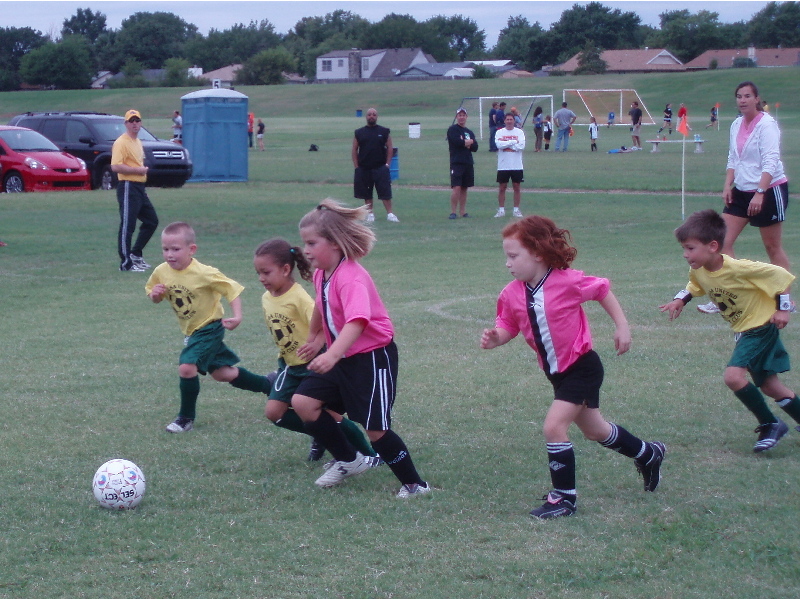 When these youngest two (not counting the kindergartner) began, they were on the same team with Coach Mom coaching. She became Coach Aunt Robin at that time. Here they both are, jumping for joy at the same age my youngest is now. All these memories rushing in. So many trophies and medals. So many games and tournaments. The meaning I get from this is that I am the luckiest person in the world. I am still alive and healthy and have seen all of them play their games and enjoy all their activities from sports to singing to art and dance. Does it get any better than this? I don’t make it to every game because that would be impossible with all the sports in all the places with all these kids, but I see enough to bask in their enthusiasm and take pride in their abilities. I’ve watched my children and grandchildren lose, pout, stomp their feet, cry, laugh and enjoy the wins. I’ve watched the kids do the “good game” hand slap walk across the fields with the other team and walk back to their parents with either the joy of victory or the sting of defeat. The best is the beginners who haven’t figured it out yet and run off the field happy either way the game ended. It’s been fun to be on the sidelines all these years. You know, it’s not too long until there may be another generation for me to follow to the kicking fields. I hope I can make it because won’t that be the best ever? 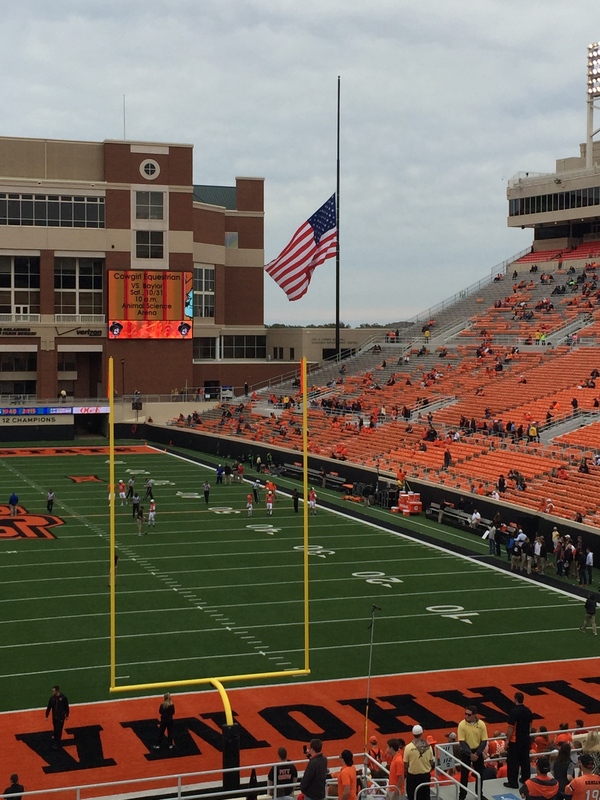 Oklahoma State University bills its Homecoming as “America’s Greatest Homecoming Celebration” with a whole lotta pride and reason to celebrate. 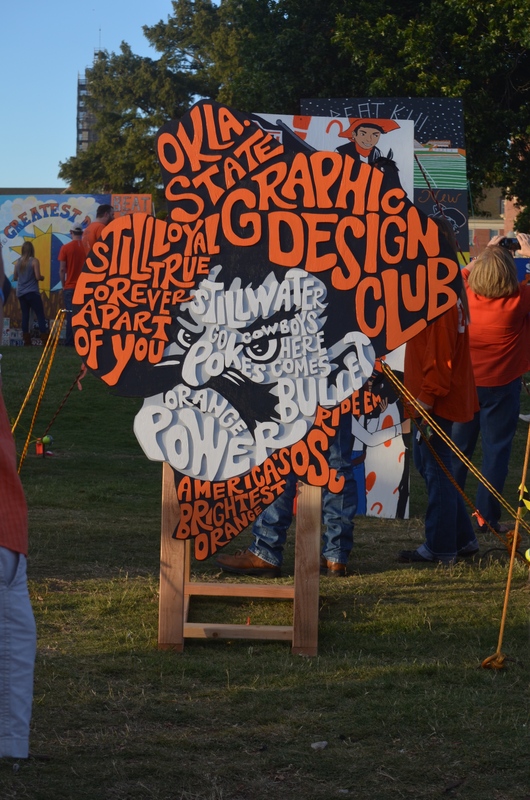 As the university celebrates its 125th year, the Homecoming theme for 2015 was “Stillwater…Still Loyal…Still True.” It makes you pause a day later because of the importance of that statement in the aftermath of a year of planning, a week of festivities, a weekend of wonder mixed with unbelievable tragedy. 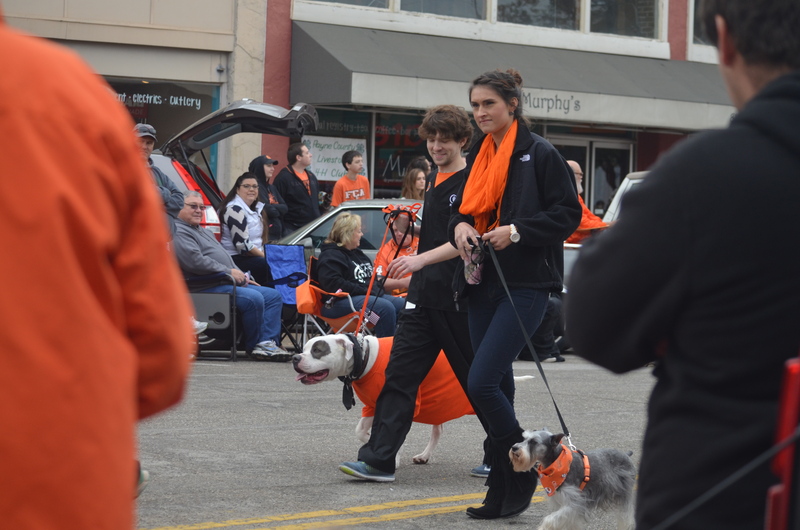 I’m an alum, was a graduate assistant in the English department back in my day, my first married years were spent in Stillwater, my oldest daughter was born in this town, some of my children and their spouses graduated from OSU, I am now on staff part time, my oldest grandson is a Freshman and I have another grandson coming here next year. I have ties galore. I really hadn’t been back for Homecoming weekend until 2011 when one of my grandsons, who was 13 at the time, and I came up for the weekend. It was such a delight that I couldn’t wait to come back. I only live a little over an hour away, but you have to plan for it. 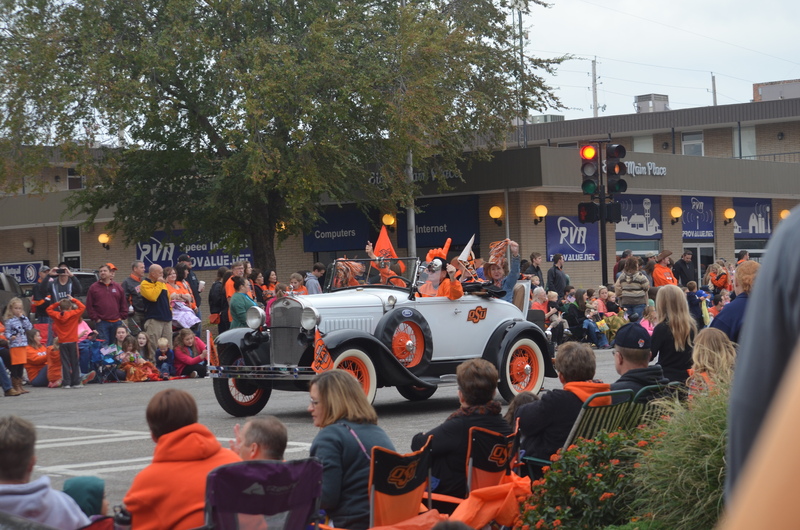 Stillwater is a town of 47,000 population, but there were 85,000 people there on Friday night this year. Yeah! 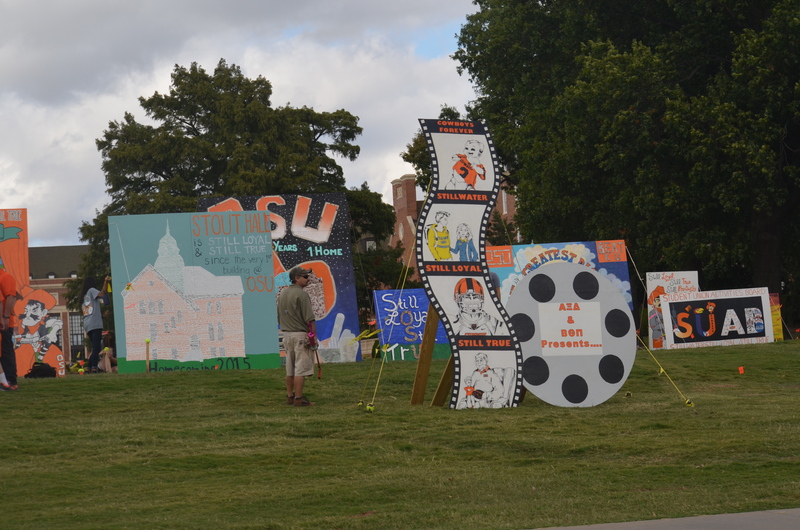 OSU Homecoming takes a year of planning, thousands of hours of work by student groups, and lasts for a week. There is something for everyone. 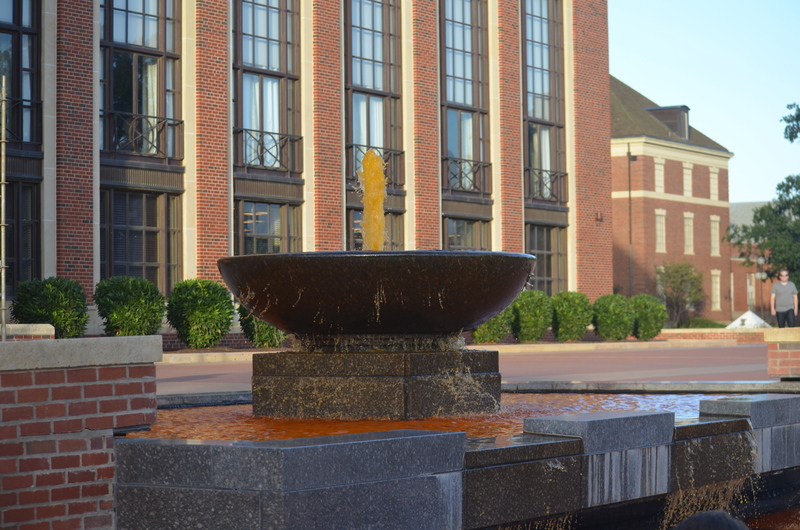 The festivities kick off on Sunday with a ceremony to dye the water in the fountain in front of the iconic library orange. America’s Brightest Orange is everywhere! Every day is a new activity, with opportunities for any student group to participate. 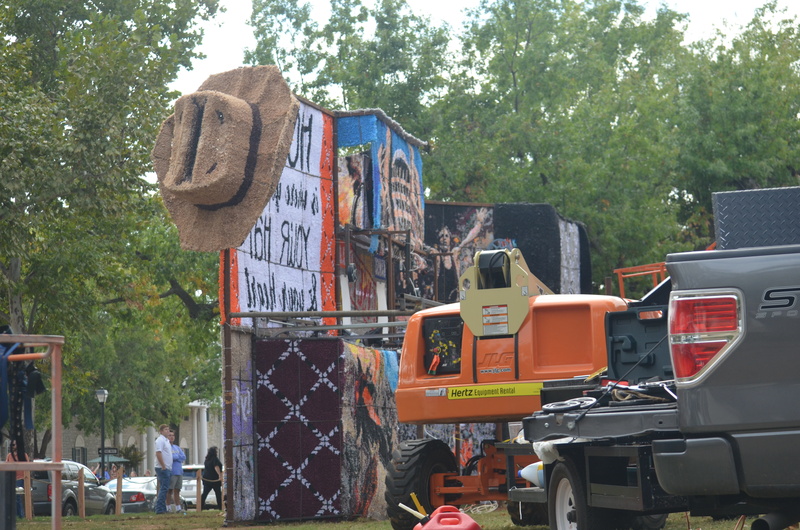 There is the Sign Contest on the library lawn, which shows off the creativity and spirit of the students… There’s a chili contest, a carnival for children, and a Paint the Street night open to anyone. 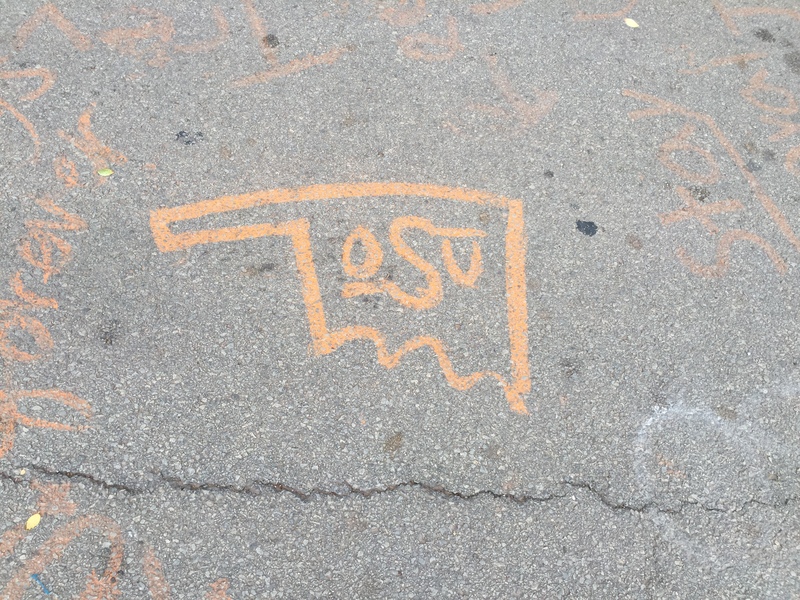 A late week rain washed away some of the work, but the remnants were under our feet walking to the stadium on Saturday. Friday night is the WalkAround, a night where the streets in front of the university are closed and people walk around to see the massive house decorations designed and created by Greek Students. These were here when I was in school, but it’s beyond my imagination to see how these are built. 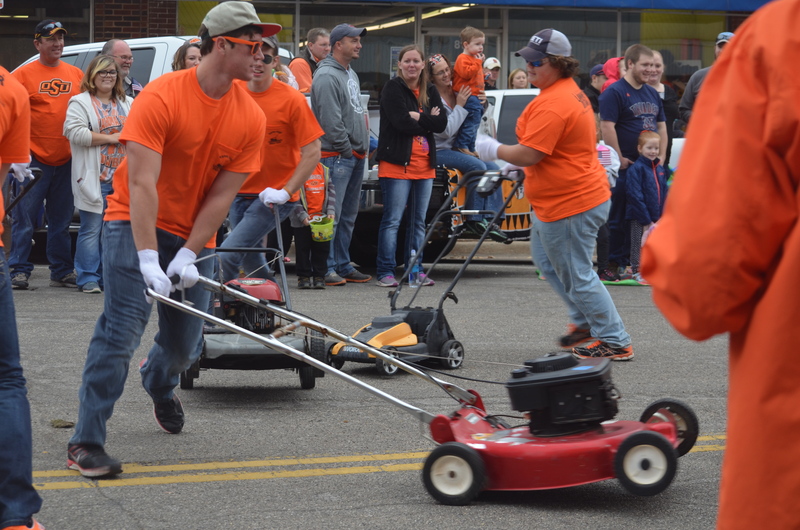 When I arrived in Stillwater for meetings early Friday, it had rained overnight and students were hustling, working with huge equipment and lifts to finish the decorations before the judges arrived at 1:00. These structures are beautiful, inspiring, have moving parts, and are great fun. It was my grandson’s first time to work on one, so I was sharing his pride. He’s in this photo in the white shirt. He’s 6’4″ to give you an idea of the size. Before one of my meetings on Friday, Pistol Pete arrived in the building. I’ve shared my love of our mascot, the only college mascot based on a real person. 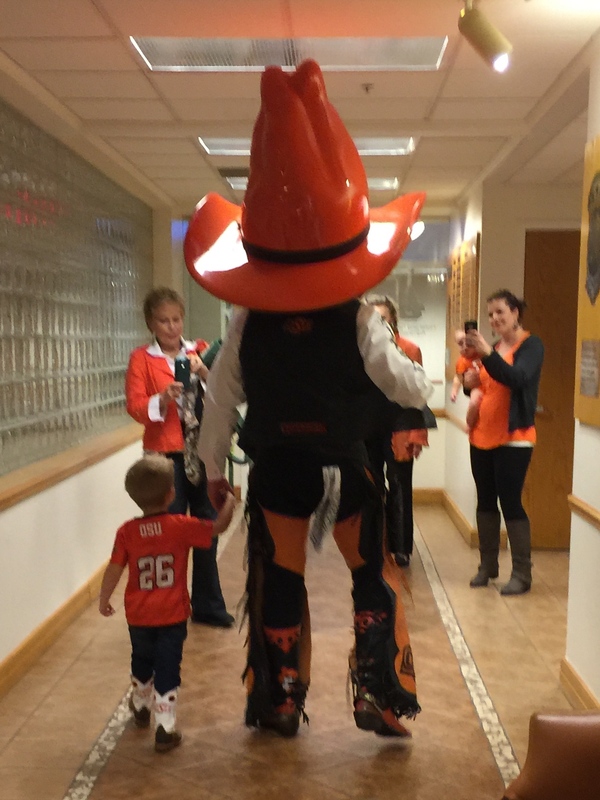 He was in our department to greet alums and I caught this shot of him walking with one of the little fans, who was just learning to say “Pistol Pete.” He had on cowboy boots with the image of Pete and his grandfather was showing him the picture on the boots and then pointing to the real Pete. I don’t know if this little one understood, but he walked off with Pete, to his mom and grandparents’ delight. 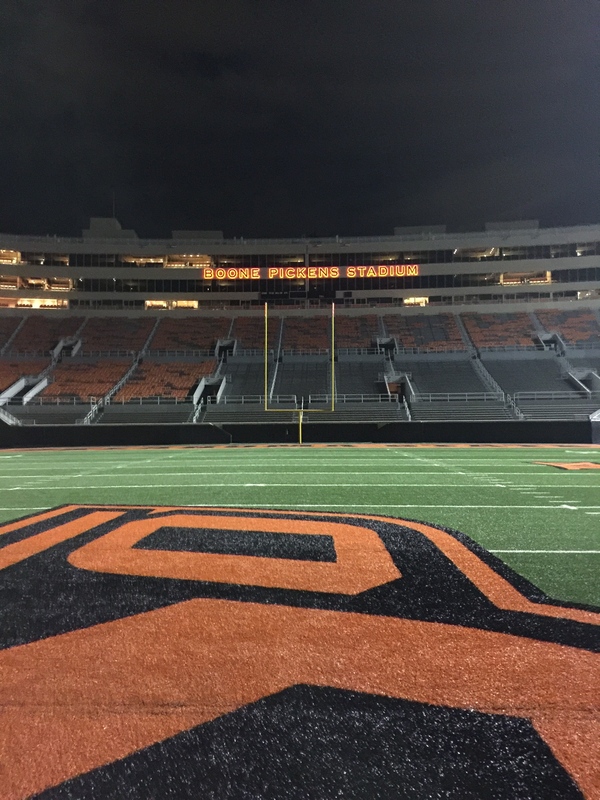 While I waited for some of my family to arrive in Stillwater for the WalkAround, I took pictures, as I always do, of things that caught my eye. 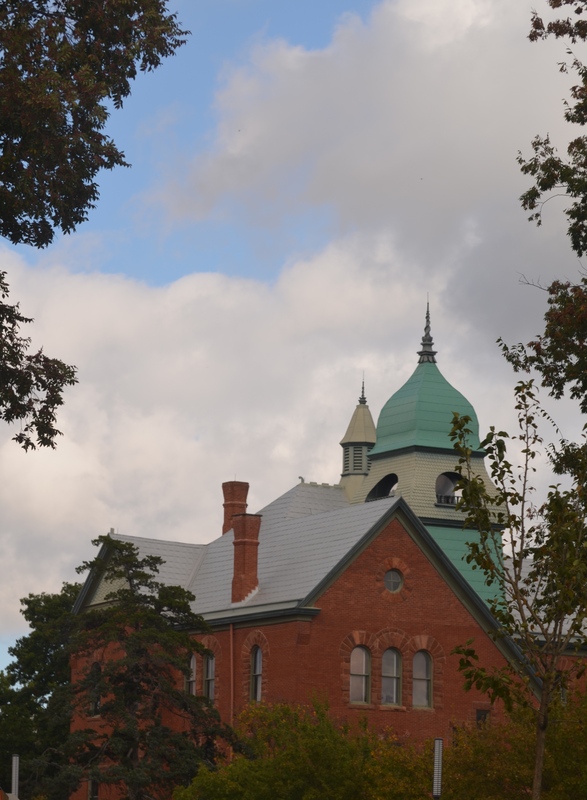 Here’s Old Central, the original building and the oldest on campus, all spiffed up to greet alums. 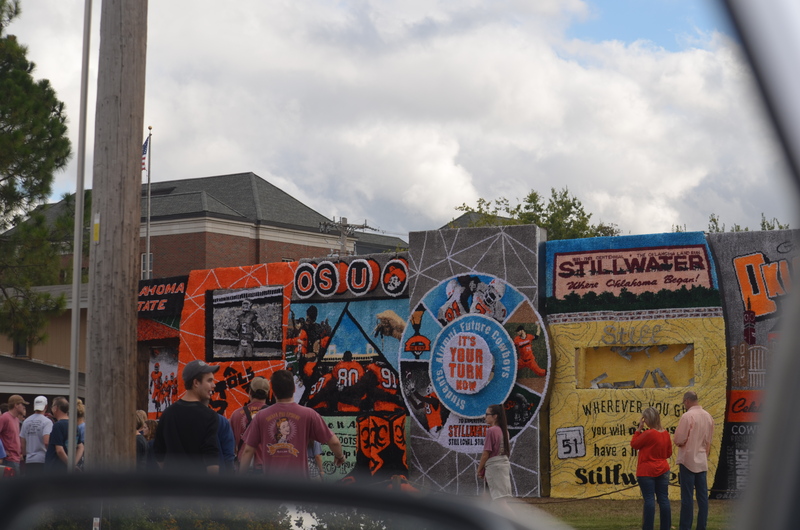 Everything was in place to greet the OSU family. 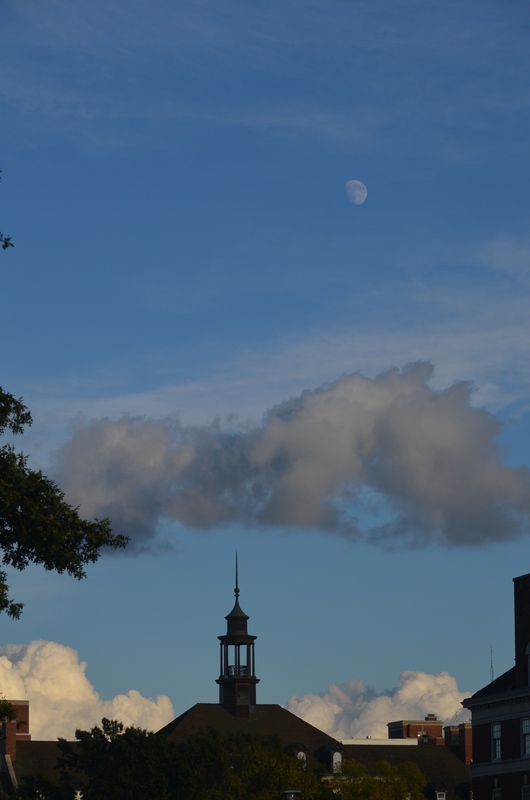 I walked across campus, catching the moon over the #1 Student Union in the country. As the crowd began to build, the strip was ready with its familiar shops, restaurants and bars. The crowds were building, the streets were closed. When I came in 2011, it was harder to find food if you didn’t want to stand in line for an hour at a restaurant. 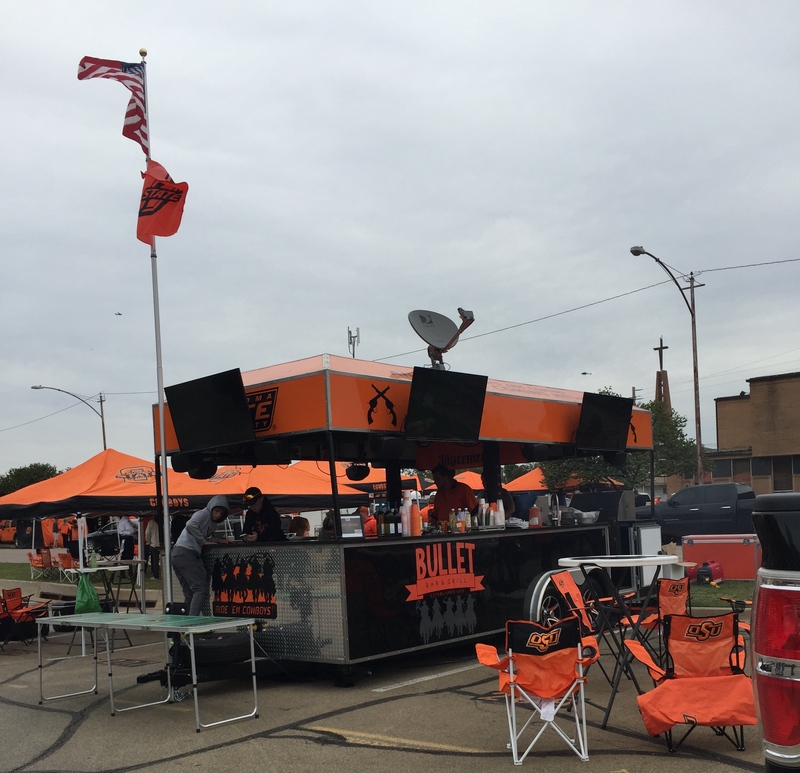 Now there are food trucks everywhere, tents with OSU clothes and gifts, activities for all ages. 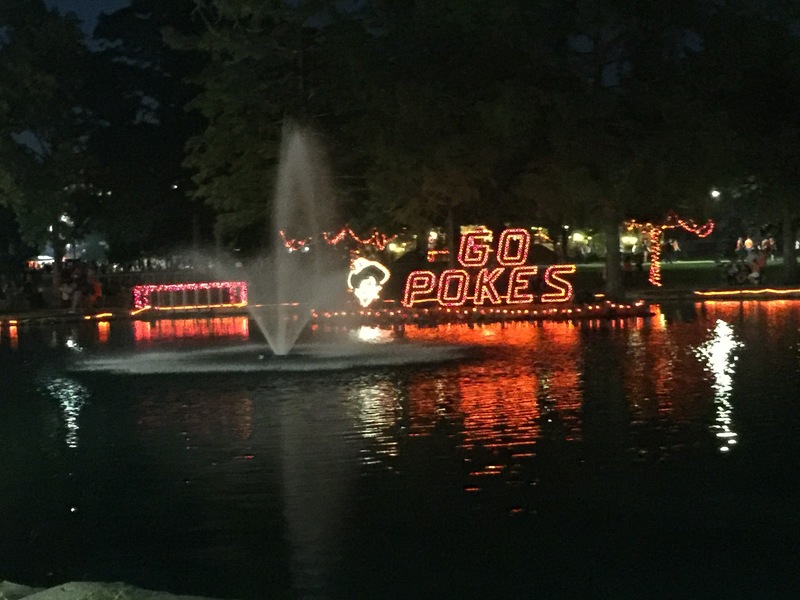 The lights came on at Theta Pond, way more beautiful than when I was in school. Five of my grandsons did the WalkAround. Four of them, including the Freshman, had never seen it before and it was fun to share it with them. 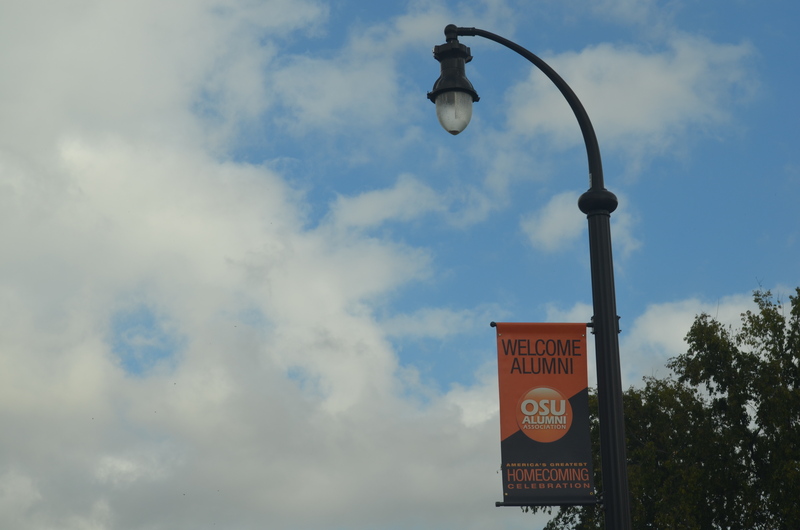 With bands playing, people of all ages filling every street, sightings of campus celebrities, members of the OSU band doing impromptu songs, dancing on the Student Union terrace, alums running into old friends, the memories flooding, the pride swelling, it’s the greatest street party ever. 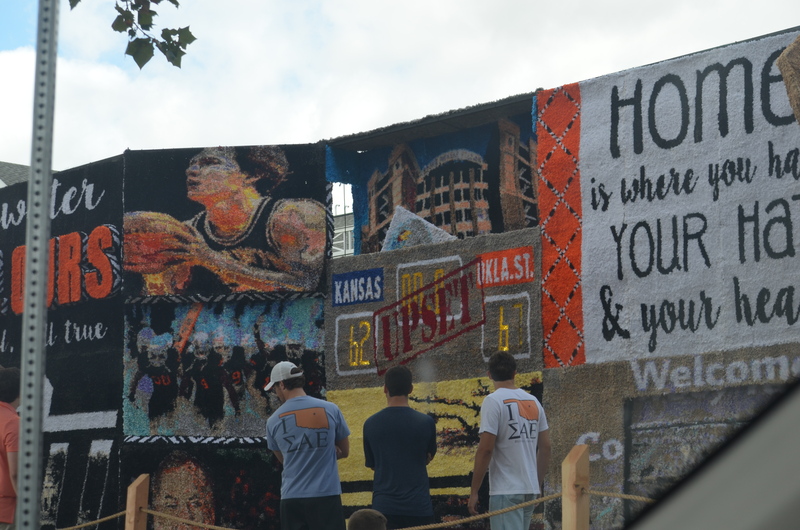 By 9:00, the major activities are winding down and the crowd can move towards famous Gallagher-Iba Arena for Homecoming & Hoops, the perfect ending to the evening. This is basically a free pep rally for students and anyone else who enjoys the noise. The arena is famous for the noisy atmosphere during basketball season and this pep rally is perfect in that space. 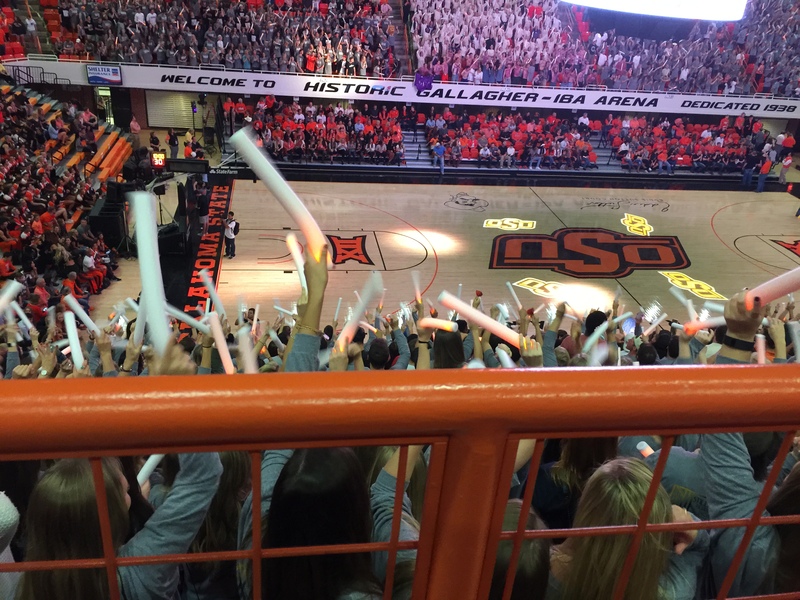 As I entered, the students were seated in groups, waving lighted sticks and screaming. The noise level is intense and my friend had ear plugs. I loved it! 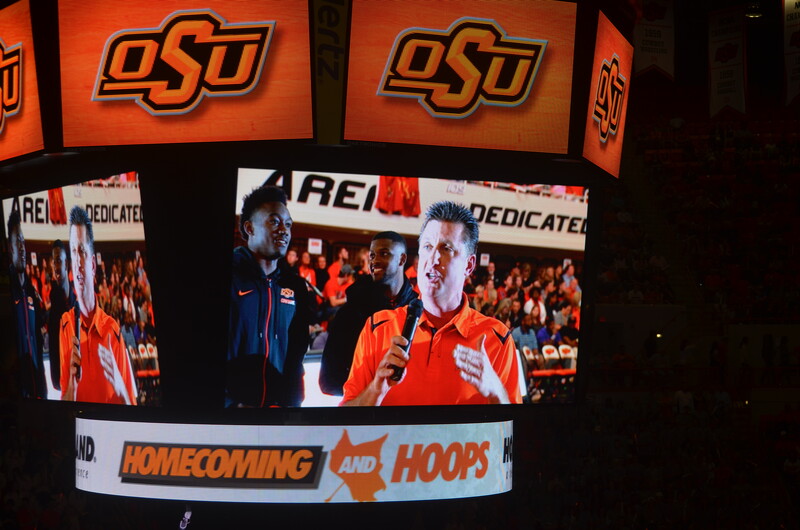 The evening begins with the football coach, Mike Gundy, thanking the students for their hard work and inviting them all to the game the next day. I watched the coach while the music was leading up to him talking. He moved with the music, shooting his hand in the air with the spirit of the evening. 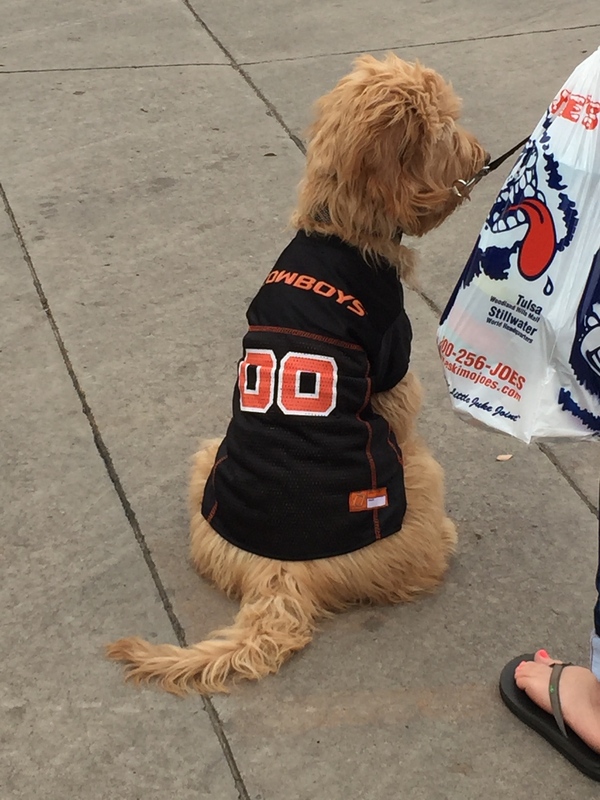 On the sidelines, he has to watch the game. 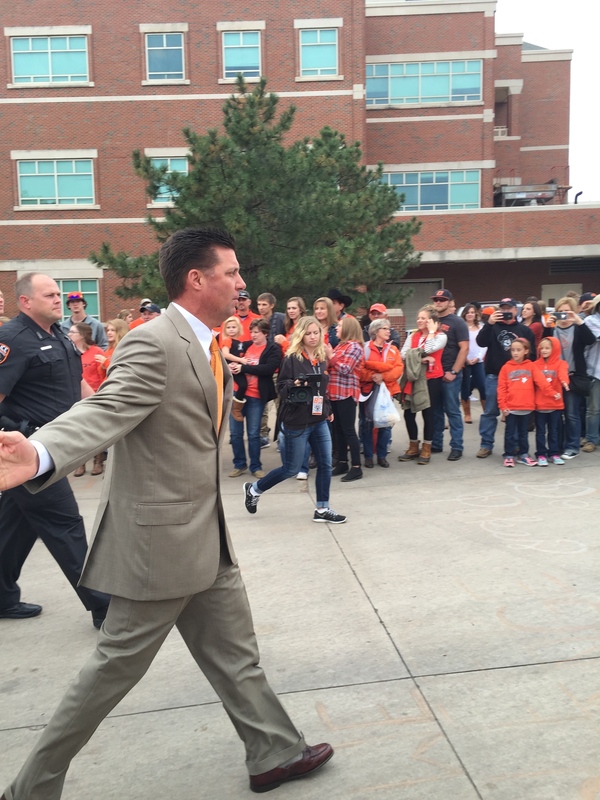 Here, he’s a Cowboy all the way – former stat breaking quarterback to coach. Here, he gets to be a fan for a few minutes before he leaves to prepare for the game. 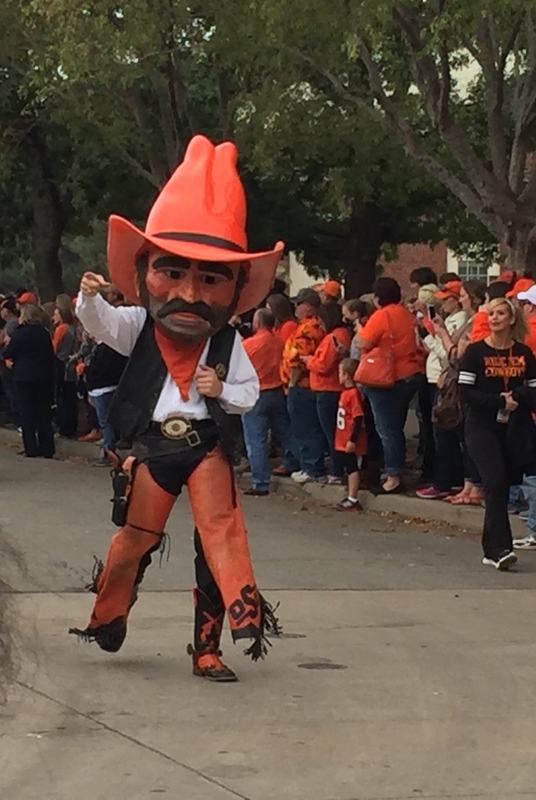 Pistol Pete is walking the sidelines, the band is playing. The OSU Women’s Basketball team gives a 10 minute preview of their skills, followed by the pom squad, a skit by the OSU Wrestling Team, a lip sync competition, announcement of winners of various contests during the week, t-shirts are shot and dropped into the student sections, small footballs are thrown to the crowds, a big demonstration by the cheerleaders, ending with a preview of the OSU Men’s Basketball Team. It’s a wild and crazy finish to the day. As we left, by luck of who I know and was with, I got to stand on the field, imagining what a young player must think and imagining what would take place the next day. Those goal posts look very narrow and that goal line is far away from the 50 yard line. Wow! By Friday night, for those of you who are into these things, I had walked over 18,000 steps. And, I still felt good. My head was full of so many years of memories and pride in what was going on in this wonderful place. Saturday morning, I was ready to go to the Sea of Orange Parade. I remember taking my oldest daughter to it when she was a baby and I loved it the last time I was here. This isn’t really something the student body attends unless they’re in it because many of them have been up all night all week getting ready for Homecoming. 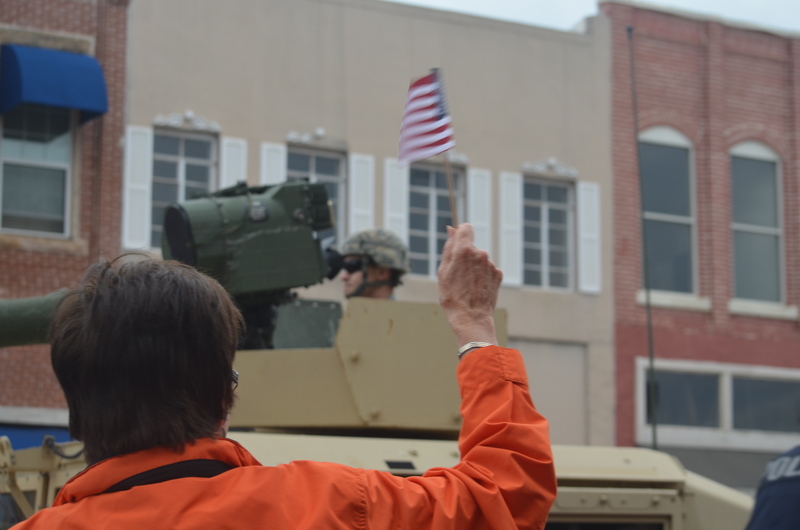 This parade is more about families, generations. 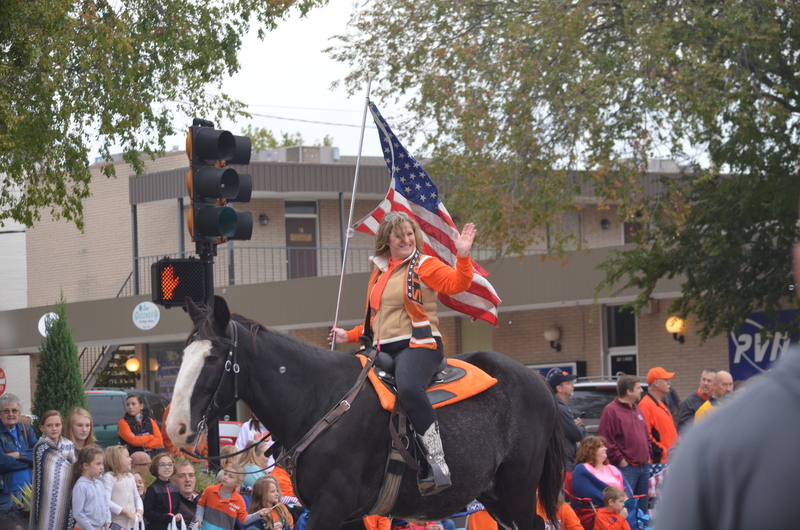 Stillwater is still a small town and this is the best of what a small town brings to a university experience. I almost didn’t go and visited with my friend I was staying with, but decided I didn’t want to miss any of this great experience and headed downtown alone. 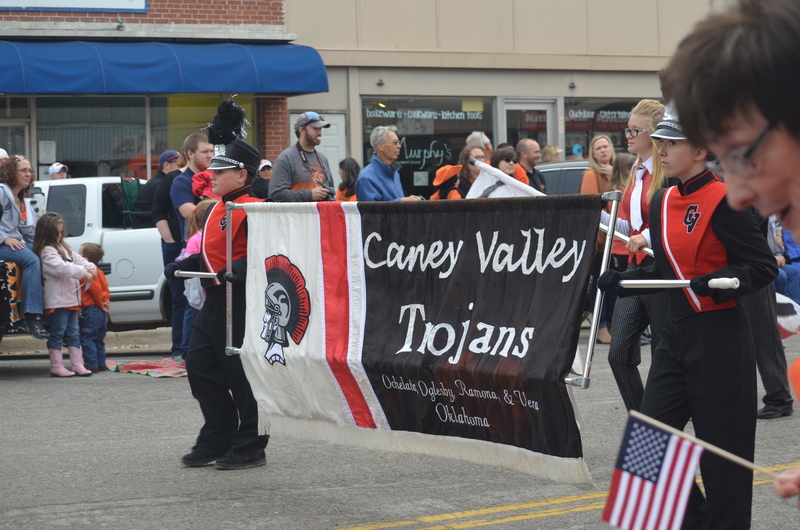 I stood near the beginning of the parade so I missed probably the first 1/3 to 1/2 of it, including the OSU Marching Band, all the OSU dignitaries, state politicians, Pistol Pete, the cheerleaders, etc. That’s ok because I got the feeling I was looking for. I’m sharing more photos with you than I planned because it really means more now. 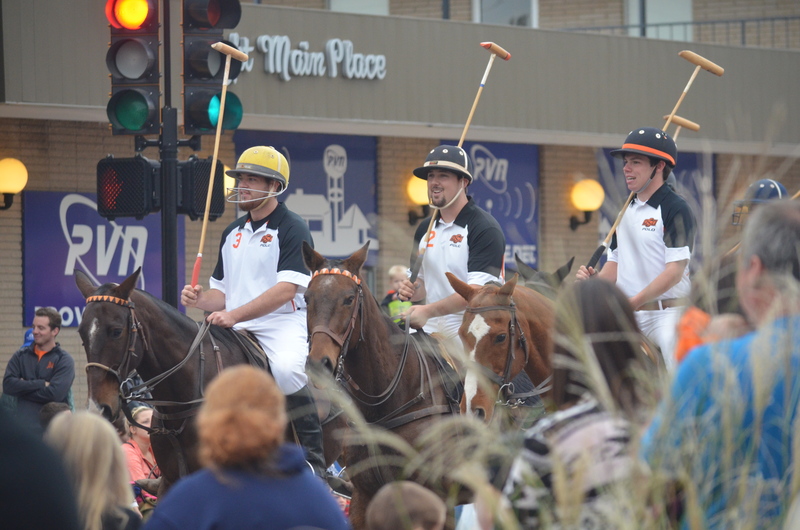 Right after the Stillwater High School band, where I came in, was the OSU Polo Team. I bet you didn’t know we had a team, did you? We also have a Rodeo Team. We do horses here. 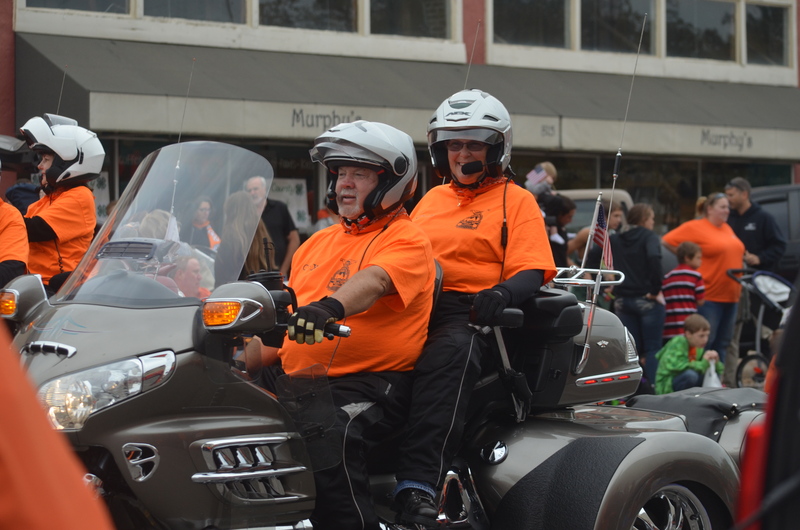 And there were other horse riding groups… and dogs… and trucks and tractors and motorcycles and cars. Note the crowds along the street. 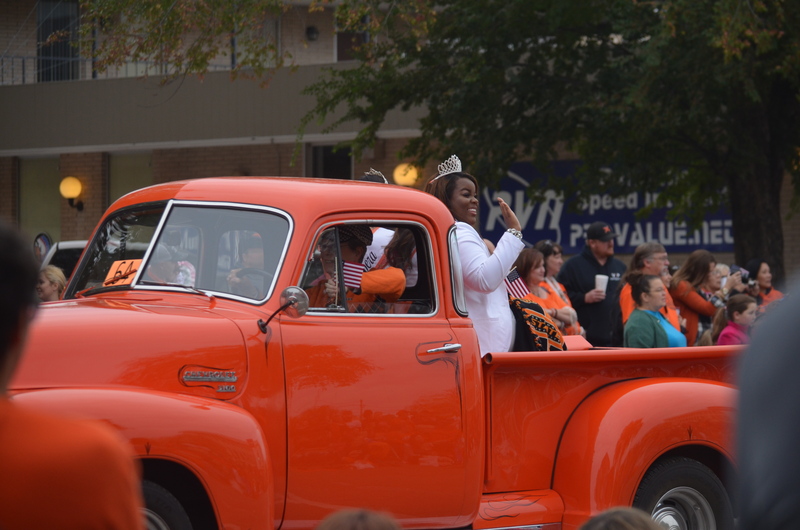 There were decorated flatbeds and walking politicians and others throwing candy to the kids with nobody acting like they were in any danger of poison candy. 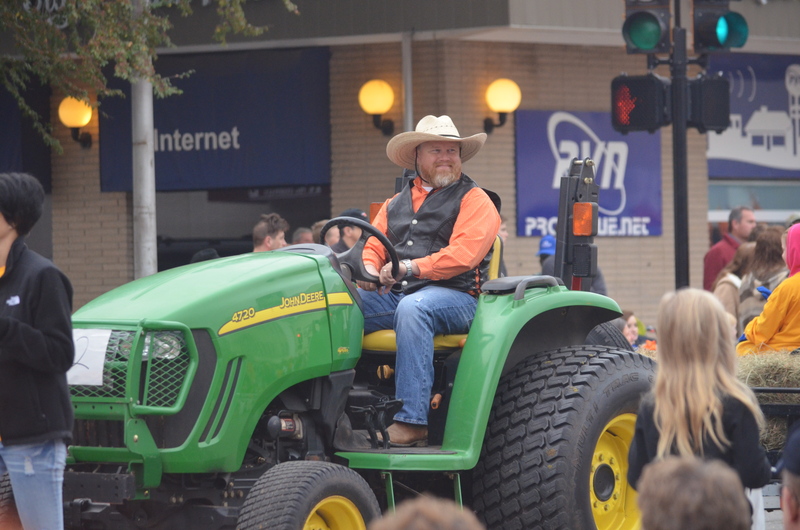 I moved down the street and stood beside pick up trucks owned by people who came early to park along the street and use the truck for parade watching. 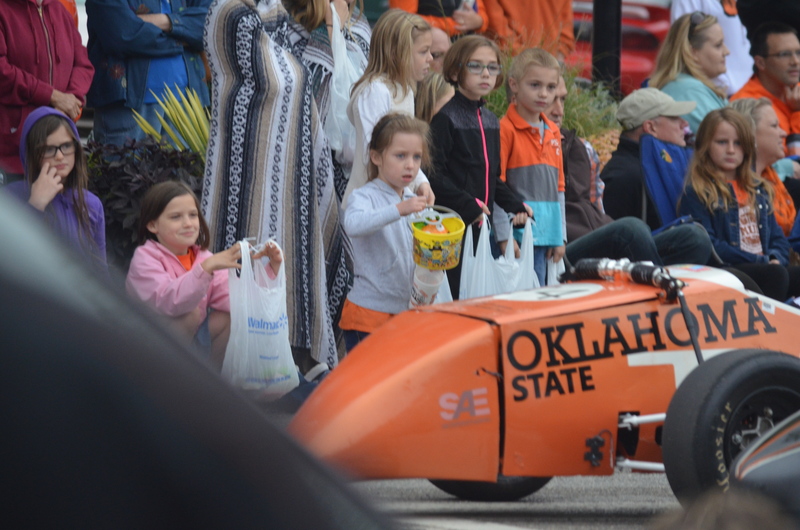 There were generations of families, waving to the parade participants, neighbors knowing everybody who walked by. 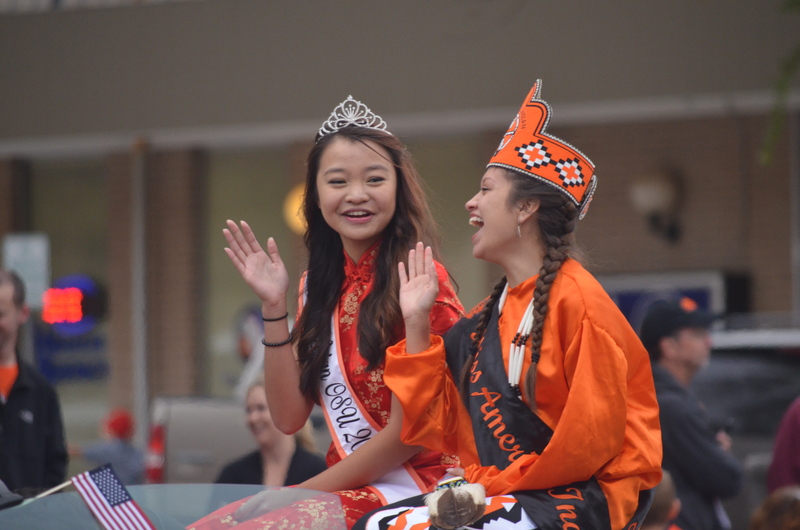 I overheard people telling each other things like, “she does my hair sometimes,” “that’s my former student,” “he lives in Perkins now.” It’s a small town atmosphere, a family setting at its best. There were beauty queens… and dance schools, and karate students, and little baton twirlers… There was pride in America… pride in our school and pride in our lives. 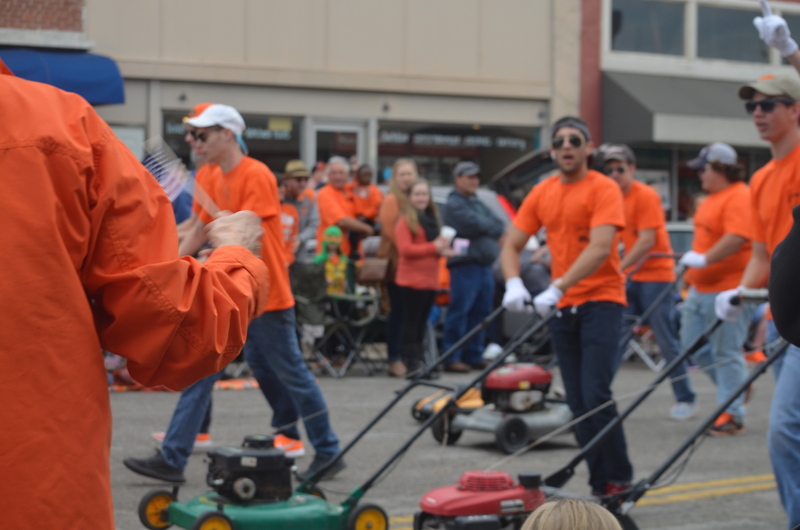 There were local celebrities… and the ever popular marching lawnmower team, doing its routines along the way. And, bands, small town bands. I’m so very impressed with the number of kids who play all these instruments in the very very small towns. That’s a tribute to some teachers, some tradition, some pride. 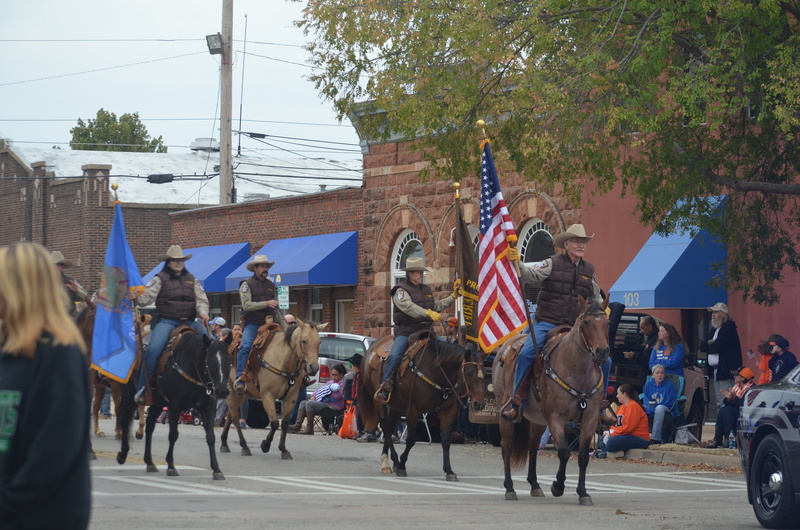 I walked up to the beginning of the parade in time to see the last of it, the mounted sheriffs turning the corner onto Main, to be followed by the Stillwater Fire Trucks. I walked to my car a little after 10:00, drove to McDonald’s to use the restroom and grab something to eat before I drove to the other side of campus to find a parking place for the game, planning to find some students and meet my friends later. I turned onto Hall of Fame and headed towards the stadium, not realizing what was going on or about to happen a couple of blocks from me. By the time I parked my car on a side street north of campus, I was starting to get messages that someone had driven a car into the parade crowds and people were killed. 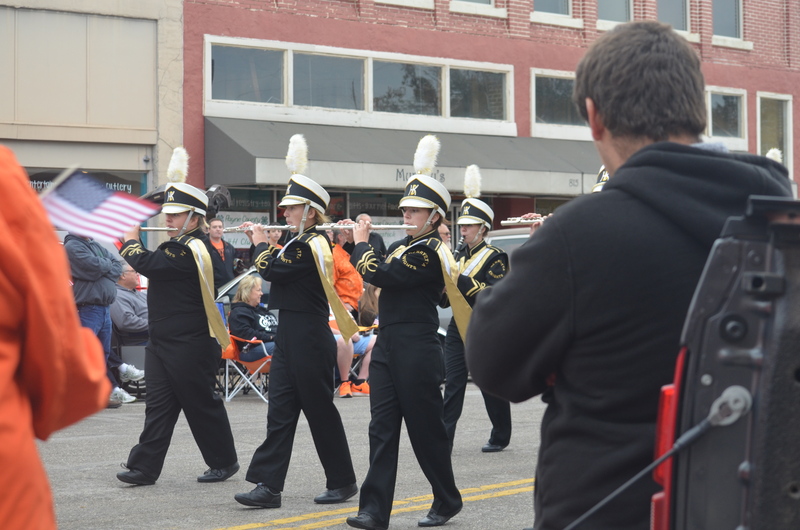 I was totally ignorant of where the parade ended, so I couldn’t place anything. Dear friends and family were contacting me to see if I was ok. What in the world? I walked the few blocks to the stadium, taking my phone charger with me because it was going down fast. This was becoming a strange day quickly. 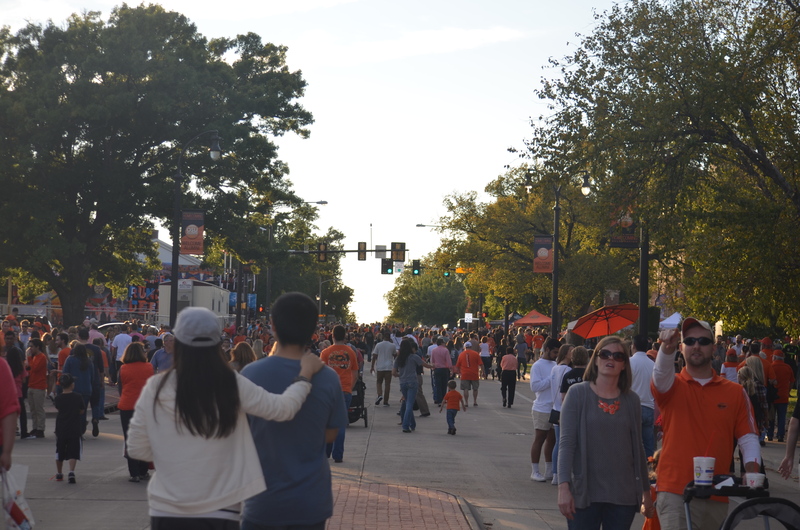 The campus was crowded with tailgate parties. I can’t begin to tell you how crowded it gets and how many parties are going on. Here was an elaborate set up near the stadium. Families and friends were gathered to eat and hug and share the day. The smells of grills and barbecue were filling the air. I realized most of these people, thousands of them didn’t know anything or much more than I did about what was happening. But there was a subdued feeling beginning to hover over us. I found one of my student friends and plugged my phone into their trailer (Gad – there is so much to tailgating now!) and heard the first rumors, all of which proved to be false. I had heard a few sirens and saw some helicopters that I assumed were news media. As I left to walk around, I lost cell coverage, maybe due to the stadium, maybe due to the mass of people using all these devices. I saw televisions in tailgate tents turned to the news, but most people probably didn’t know unless they were being contacted. I was getting messages on Facebook, texts, etc. I was using power fast trying to reassure everyone. For some reason, this orange colored dog made me smile in the middle of this strange time. Mostly the campus was Homecoming as usual, maybe quieter when I think back. It was a day of celebration and of shock. 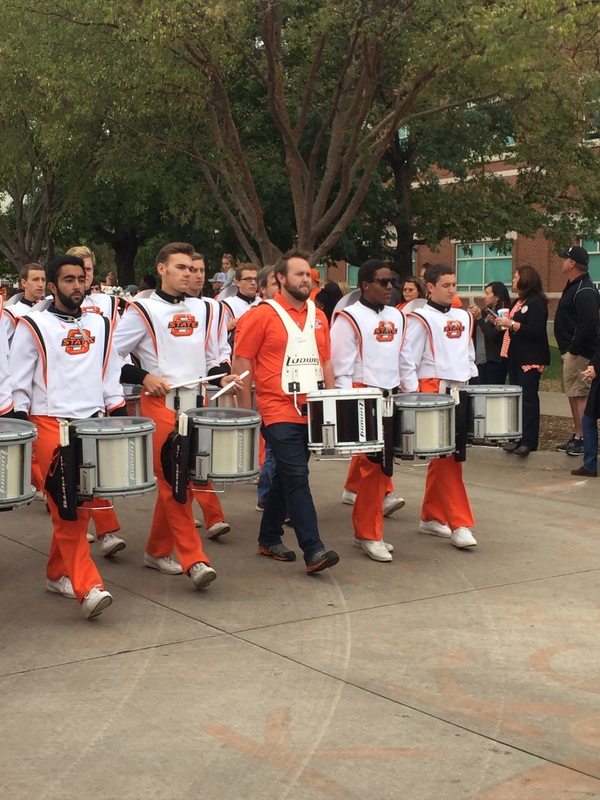 It was time for The Walk, the parade of the band, cheerleaders, pom squad, coaches and players walking across campus to the stadium through a line of fans and well wishers. Usually this is noisy and boisterous. Today was quiet. The band wasn’t playing, other than a few drummers with a somber march. 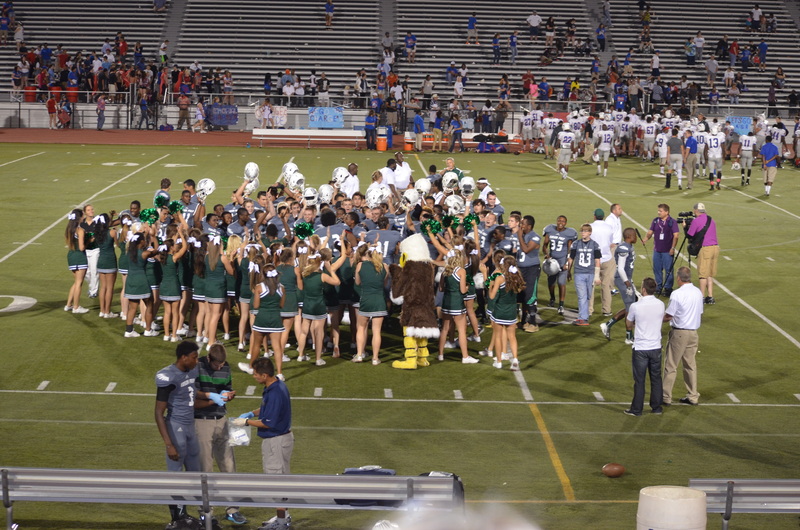 They were followed by quiet, respectful cheerleaders and pom squad. Pete arrived, cheering the crowd as always, somehow reassuring that our world is still there, living and breathing. The team walked by, huge kids. One stopped to give hugs to the people next to me. I’m sure they wanted reassurance, too. They may be big, but they’re somebody’s kid. Coach walked by, slapping the hand of the woman next to me who reached out to him. There was no noise at the end, the parade filtered into the stadium in silence. 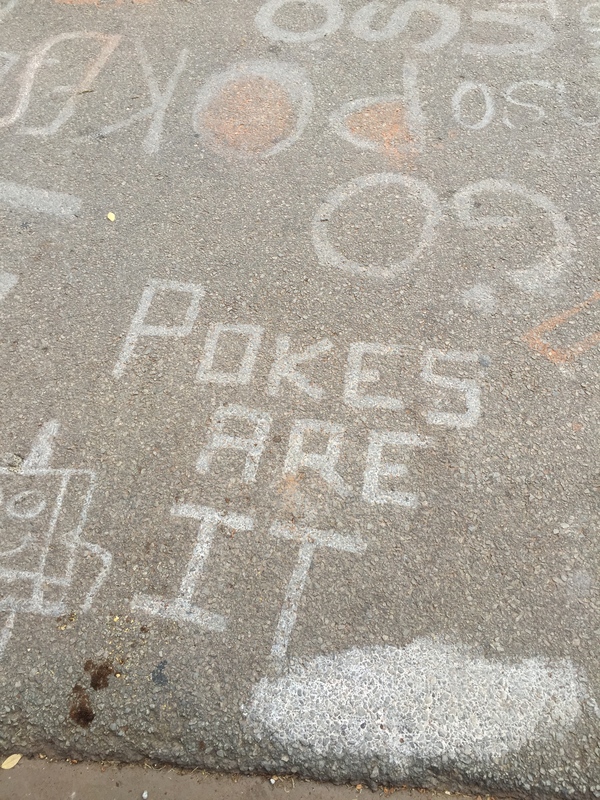 Game Day was here. I decided to go into the stadium early because it’s fun to watch it get set up and I knew my friends were somewhere on their way. Besides, I was still having trouble with texts and messages getting through. Walking into the stadium early, the first thing that smacked me in my heart was the great flag at half mast. It’s really true and happening to these families so close by. You couldn’t shake that image all day long. So I filled the next hour watching the crowd build, the team practicing with different units, the school fight songs filling the air. The team came out and warmed up in formation, which I think is so cool They went back to the locker room, preparing to make their entrance. 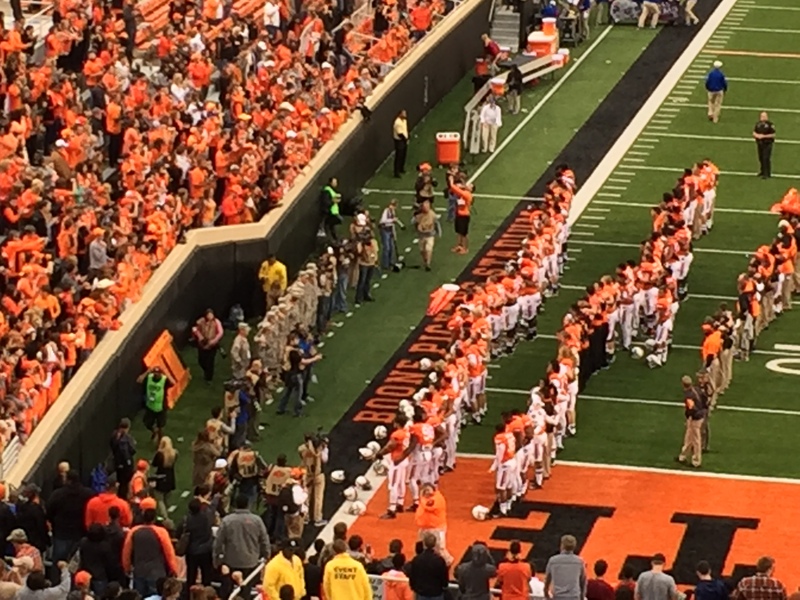 The KU and OSU bands played and everyone got in place to welcome the team to the field. I felt curiosity, waiting to see how this was going to be handled. As seen on television, there was a moment of silence, appropriate for all. 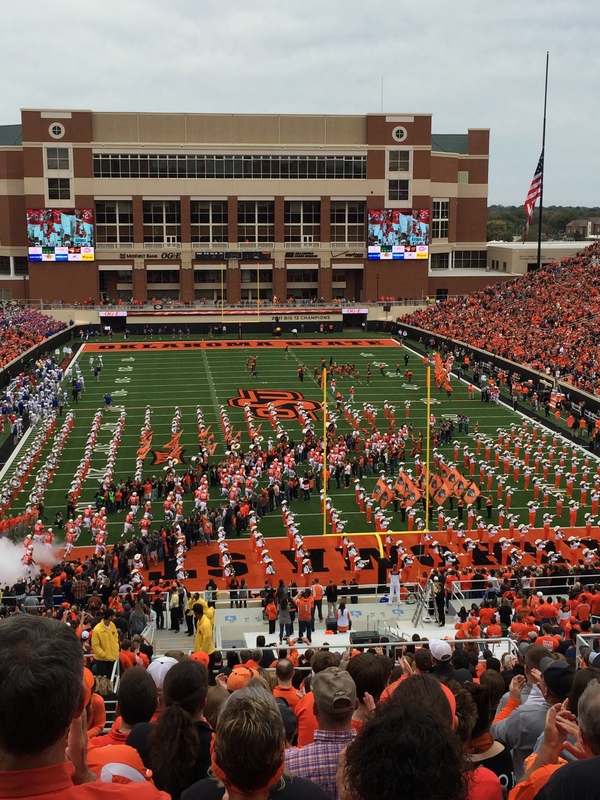 The game was played, OSU won in a lopsided victory that made it easy for fans to slip out after the half-time. I stayed to the end, holding my friend as we sang and swayed to the alma mater along with the tradition of the team singing it with the students after the game. I stopped at a friend’s house after the game, welcoming the chance to get dinner and talk a little before I drove home. 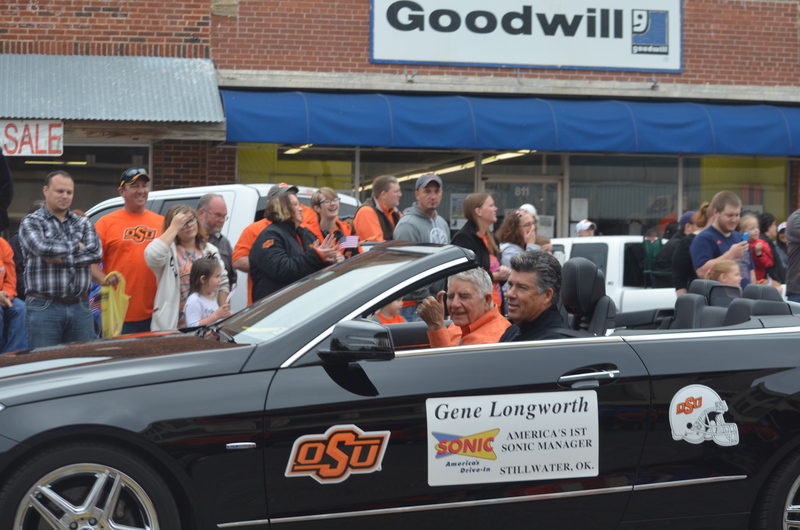 It was nice to be with good people, Stillwater residents, though there is no sense to be made of the tragedy of the day. 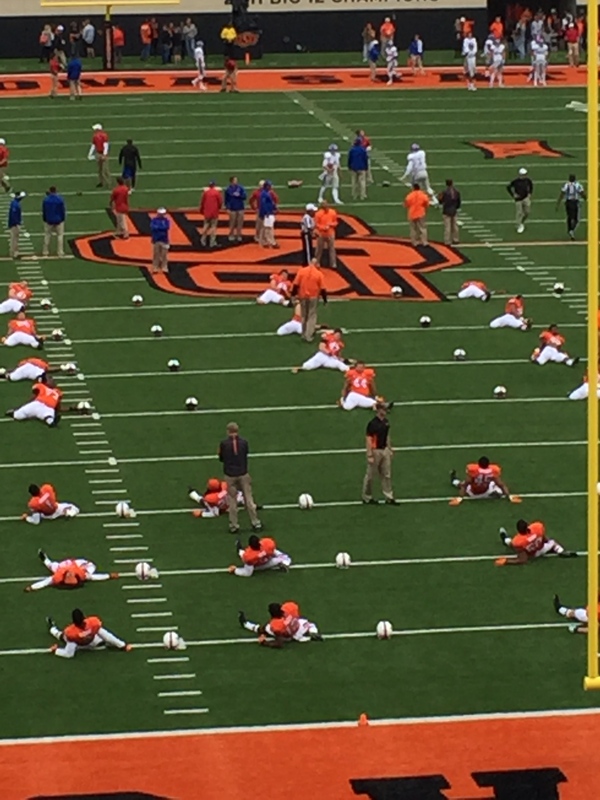 Someone said this was not just an OSU tragedy, this was a Stillwater tragedy. I’ve been through senseless things before, I’ve lost loved ones. I watched video of the crash, horrified to see how close the children on a parade truck and walking came to being hit. I’m horrified they had to see this, horrified that it will haunt them forever. My love goes out to those who were there because the rest of us can only hold them in our hearts and hope for their physical and mental recovery. 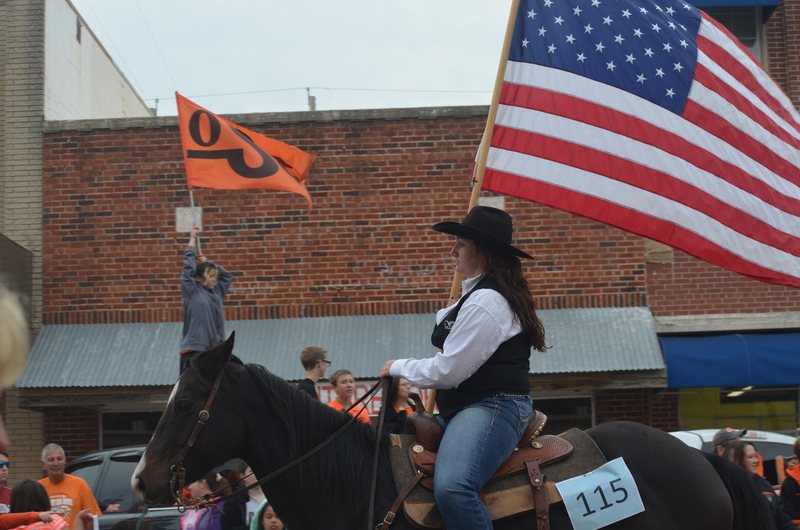 The one thing I do know is that the irony of having something like this happen in the middle of such a great traditional weekend of Homecoming is offset just a little knowing how strong the ties are in the community of Stillwater and OSU. This is a strong family with shared memories and a lot of pride and love. It will help. It will. I’m a very lucky girl…well, a very lucky old girl. My children and grandchildren live close by, all 15 of them, so I can see them as often as we can fit into our busy schedules. I try to see them one on one and as a family whenever we can. I’m so happy to be here to see them grow up – and that includes my own children. With eight grandchildren, six boys and two girls, one in college, four in high school, two in middle school, and one in Kindergarten, there are lots of ball games, assemblies, grandparents’ days, graduations and, of course, birthdays and holidays. 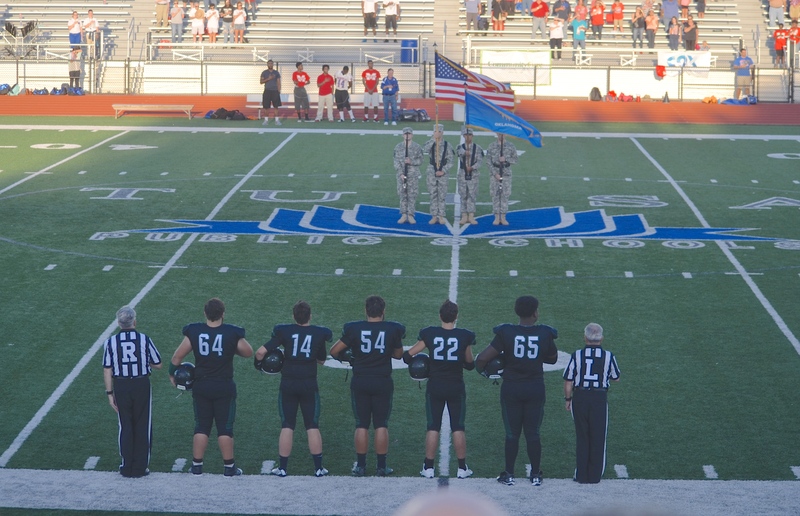 I’ve realized that there is one unique event that has become very special to me – high school football games. I’ve got grandkids playing varsity football, baseball and soccer and the younger ones playing volleyball, baseball and basketball, so there are plenty of games to see. The difference in the football games is that everyone tends to go to those. I’m not making a judgment because I sometimes have this happen at baseball or soccer games, but football is the one right now. We’ll hope for more crowds at the other sports. At family gatherings of any kind, I love to sit back and watch the kids, and I include my kids and grandkids in the word kids, interact with each other. Sometimes, I’m probably too quiet, hiding behind my camera, watching them. At the football games, I have the ultimate fly on the wall experience with my family. 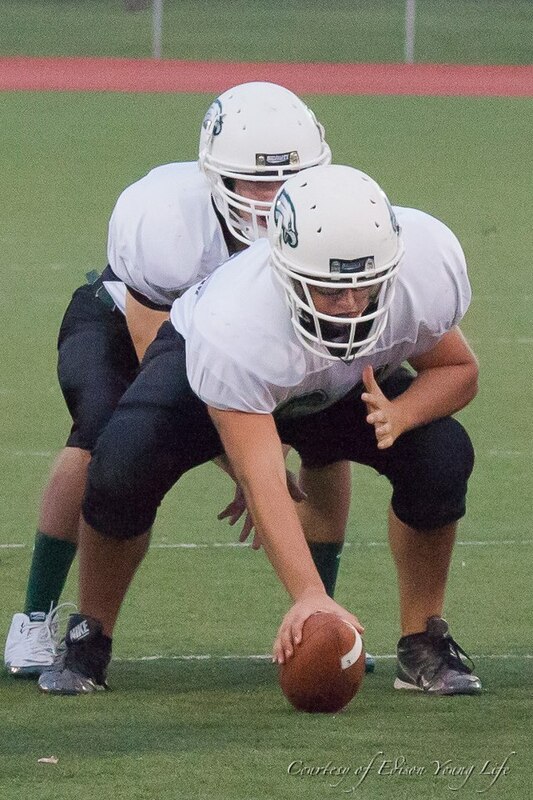 This season, I have a grandson, a senior, playing center on the team. His father is the president of the football parents and he sometimes announces games. Since he is a comedian by nature and sometimes avocation, as well as a former football player who knows the game, he is well appreciated by the crowd. His wife, my youngest daughter, is in the crowd cheering for her guys. Did I mention that most of us graduated from the same high school the kids go to? That adds to the fun with our third generation of Eagles. My middle daughter is one of the leaders of the soccer parents group (don’t know her exact title, but she works hard) and they are running the concession stand this year to raise money for the soccer team. I can find her there and can watch her leadership skills in action. Her husband is in the crowd – another alum. My oldest daughter and her husband come to see the games and cheer for their nephew and watch the kids. They are active in the baseball parents group. And my daughter-in-law, another alum, brings the Kindergartener to the games when she can. I can sit with my big kids in the stands, or I don’t even mind sitting alone, watching everyone go by. Besides the fun of the band and pom and cheer squads, I’m cheering for my grandson and taking pictures – because that’s what I do. Last week, my grandson was one of the team captains, a proud moment for all. Besides the game, I’m watching the students interact, seeing how my grandkids act with their friends. Even though they wave at me or sometimes come sit for a minute and say hi, they are mostly oblivious to my being there. I get to be that fly on the wall, watching them in their own world. 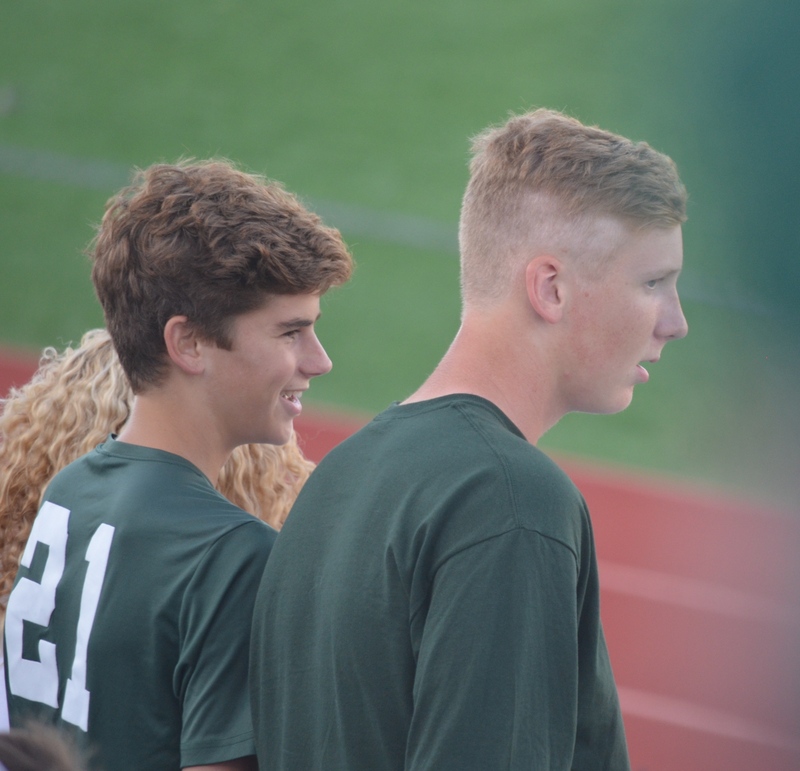 Here’s my tall grandson, the senior soccer player, leading the student section, cheering for the team and his cousin and friends. I love the diversity of this school, which was once as white as white could be. My grandsons, who are sophomores, are beginning to participate more. They’re the best of buddies since birth and tend to hang out together as they make their way through the awkward social strata of high school. One drives and one has his learner’s permit, so they’re entering that scary world. Well, scary for parents and grandparents. The two eighth graders, a boy and a girl, are not into hanging together as much as they did when they were very little, and they roam the stands with their own posses, although I see them acknowledge each other here and there. 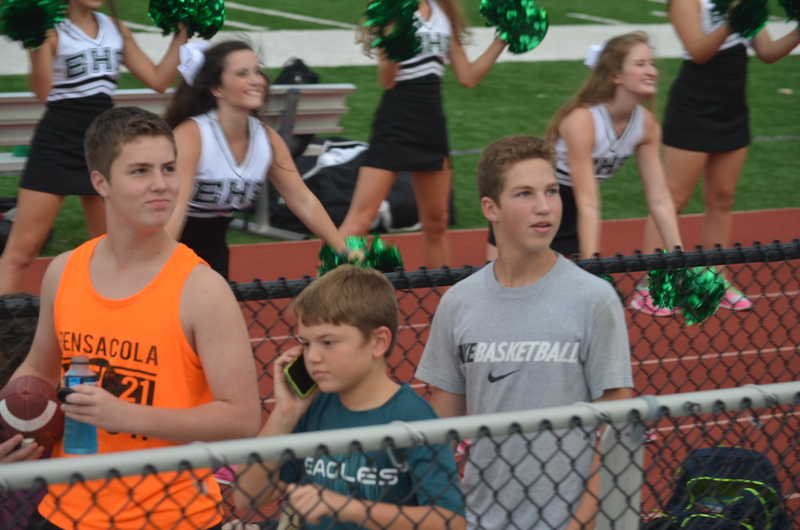 They are usually looking for their parents in the stands to ask for money for snacks. I also see the cousins interact, which makes me happy. You can’t beat that feeling. 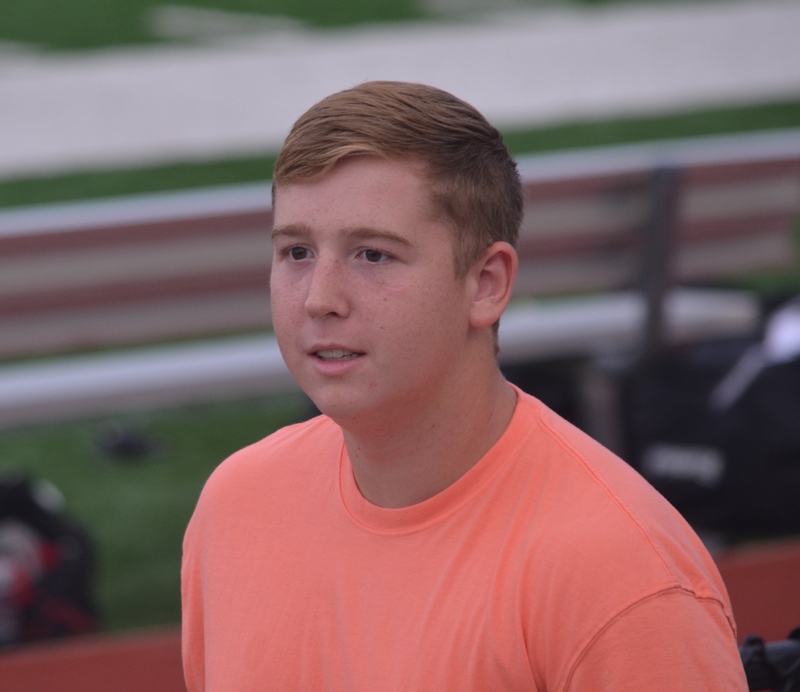 During some games, my oldest grandson shows up, home from college to pick up his girlfriend, a senior. He’s the alum now, welcomed by his friends who are still in high school or catching up with friends also at the game. 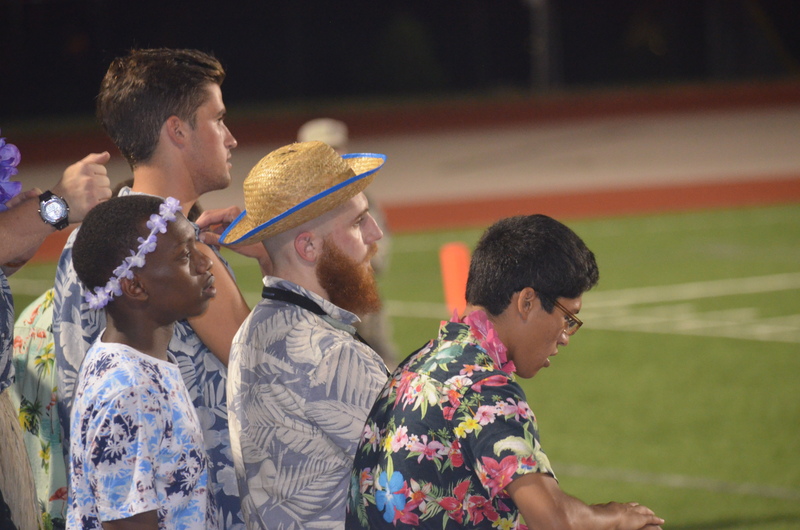 He was the senior spirit leader last year but stays away from the student section now. He’s past that – or knows that the seniors need to have their own year. There is so much to take in, watching my kids go by. I can see my own children interacting with their friends, greeting other parents they know through their kids. Again, it’s nice to see the parents greeting, hugging and cheering with other parents, forgetting racial and other differences. It gives you hope. Through my fly on the wall position, I can hear the music, see the trends, and keep up with a little of what’s going on in the world of teenagers. I can check the expressions and body language of my most precious loved ones. I can see how they are doing in a world that I am really removed from in their daily lives, but get a taste of at the football games. I hope this is what heaven lets me do – watch them from above, sending love and support their way. Mostly, I rejoice in the fact that I am there and can watch them grow up. I take pride in the fact that they are all adjusting well to their world, making friends, participating in activities, learning about life. I can see their smiles and watch them laugh with their friends. You know what? It makes my heart sing. When I was a girl, we played jacks all the time. It was great because you could play it alone or with friends and we were all good at it and we must have played for hours at a time. 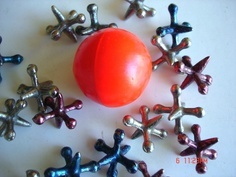 If you have forgotten or don’t know what the game of jacks is, here’s a picture… I hadn’t thought about jacks in years and, when I did, I texted my daughters to make sure I had taught them how to play. One responded that she remembered it, but didn’t play much. I was feeling like a failure as a mother at that point, but vowed to teach my granddaughters, even though one is probably too old to get into it at this point. Finding a set took a little while since we don’t have dime stores around any more. The sets I remembered as a child had the red rubber ball seen in the photo, but we preferred a golf ball, which we always had around the house. I finally found a set in town, but it only had eight jacks and I remembered more and had a tiny, hard rubber ball. We tended to play with double sets as we got better and were looking for more challenges. The set had good sturdy jacks, not the light ones they started making way back. You have to start with good jacks – I remember that. And, I had a golf ball I could use. We played several games…regular jacks, pigs in the pen (which I loved), cherries in the basket, round the world, and whatever game kids could invent. 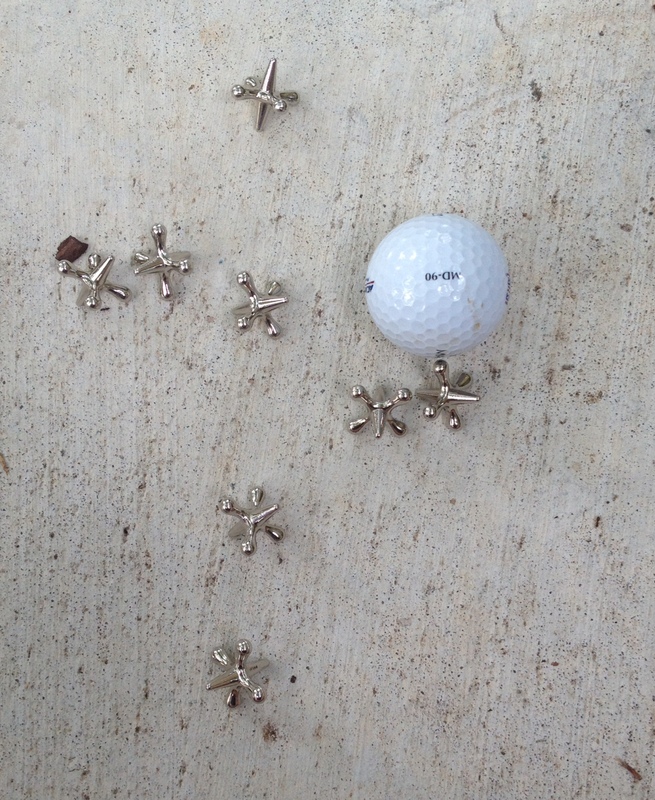 Last night, I took my eight jacks and a golf ball and sat down on my sidewalk to see if I could still play. It took a few times for my memory to kick in, but it was all coming back. I had to adjust for the fact my fingernails are longer and were scratching the pavement, but somehow I figured out how to stop that. Actually, the hardest thing…don’t laugh…was that the ball tended to bounce away and this old lady doesn’t get up as fast as she used to. I don’t remember that being part of the game. When you’re little, your back doesn’t hurt and you bounce up and down with ease. Sigh. Anyway, it was coming back to me more quickly than I thought. I need to practice, but I can still do it. When I was trying to find jacks, which you can get online, I saw an article on how good the game is, how it teaches children dexterity. I am sure that my parents never read an article on the benefits of the game and that we wouldn’t have thought much about it. For gosh sakes, of course it was good for us. It’s fun! Growing up in the 50s and 60s, there weren’t a lot of organized sports for kids. We played the usual at school and learned softball/baseball, soccer, tetherball, etc. At home, we played workup and kicked the ball around and were always doing something outside, just not very organized except to us. I took golf lessons and swimming lessons, but there weren’t any teams for a girl to be on. We had intramural basketball and some other sports in high school. 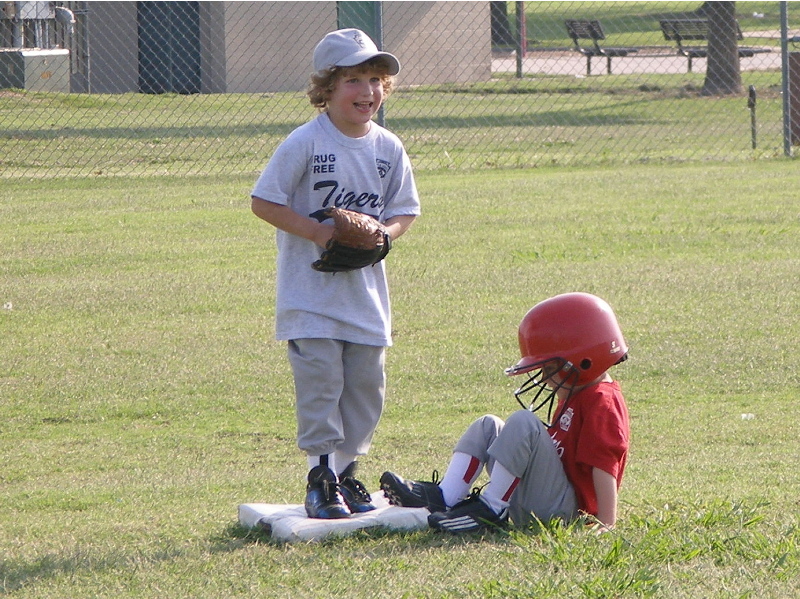 My brother played baseball when he was a kid, but I only remember going to a couple of games and we sat on the sides in the dirt. The coach took the team in his car for ice cream sometimes. My husband played baseball through junior high and there were, of course, teams in all the sports for the boys. I had a couple of trophies, mainly for jr. golf tournaments or an occasional swim medal on the 4th of July. I’ll have to take partial blame for what my generation did to sports. As parents of three girls and a boy, we made sure they were exposed to just about everything from music to scouting to church to sports. Between my four, there were lessons or teams in these sports through the years: soccer (all four played and one went through college on a partial scholarship, one of the first group of girls to get one), swimming (all four swam competitively), golf, tennis, softball/baseball, football, ice skating, track, basketball. What’s left? It was a time to encourage girls that they too could be a champion in whatever they wanted to do. Mostly, our fields were pretty primitive, barely mowed for play. 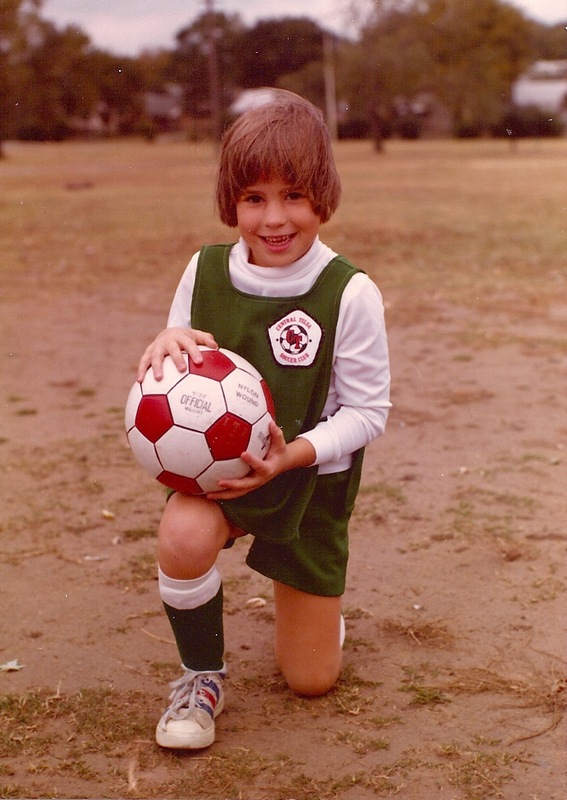 Uniforms were basic t-shirts or homemade when my girls started soccer. There were no cleats. That market grew quickly and they soon looked like mini-pros. Still pretty basic though. I’ve been a scorekeeper and a timekeeper and mostly a carpooler. On Saturdays, my husband worked and I drove all over the place. I also drove to all the practices and lessons, often on all sides of town the same day. (How many years was that? Let’s say 20 years. I shouldn’t have figured that out.) 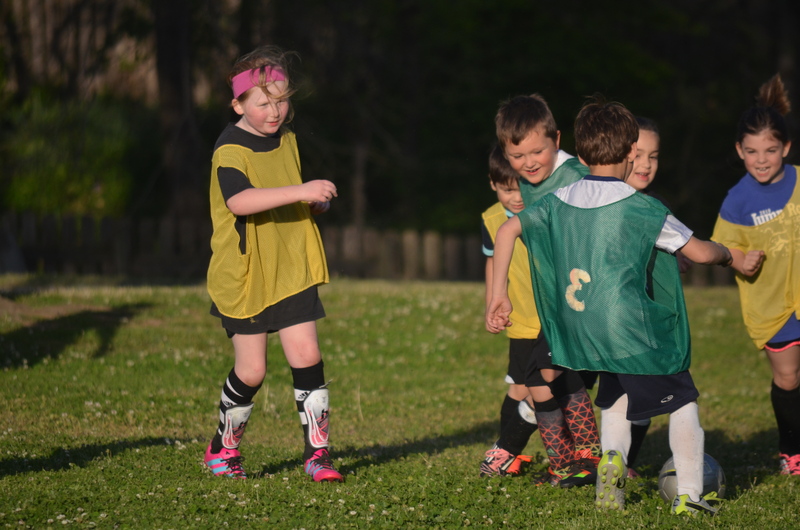 We didn’t encourage the new competitive leagues because it was too much of a burden on the family, travel, time and money wise to devote that much to just one of the kids. The one who went that direction excelled on her high school team and got the scholarship anyway. 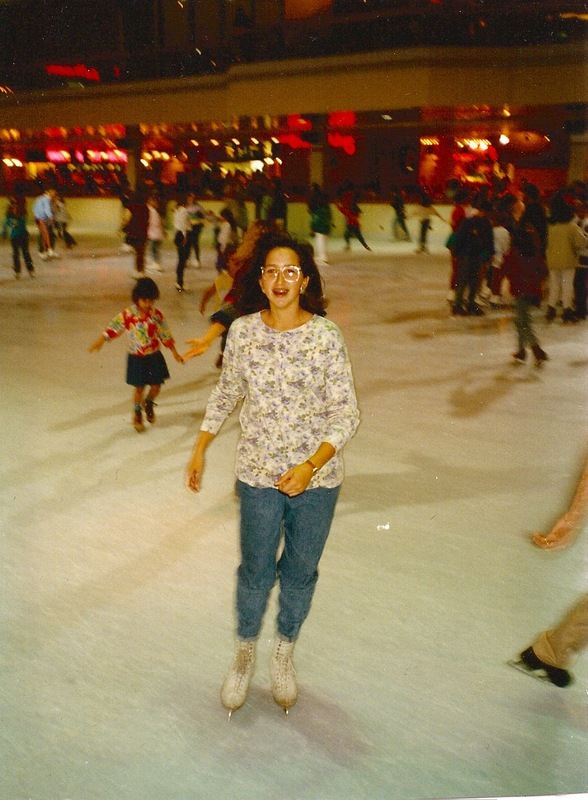 I worked for many years at the local ice rink, doing marketing and working with the families. I talked to aspiring Olympic moms and dads, telling them the benefits of the sport without giving them false hope their talented child would be one of the extremely few who made the Olympic team. But, you can’t discourage parents when they have a talent. I know that. My eight grandkids, 6 boys and 2 girls, are all in sports in a big way. Well, the 4-year old isn’t there yet. The others, ages 12-17, are now down to playing football (1), soccer (3), baseball (3) and basketball (5). Several are on both school and competitive league games (or whatever they are called). They play games all over the country all the time, sometimes with up to three games a day. I will have to say my kids never played more than two a day and I can’t even remember that. And they have practices, too. It’s a lifestyle choice for parents because it takes a lot of money and a lot of time for the whole family. There are a lot of trophies, big trophies, and scouts who come to even the games of the youngest to recruit for high school, college and the pros. There are specialized coaches, and uniforms and equipment bags and iPad apps for keeping stats and scores and paid coaches and parents who follow the games religiously. It’s very sophisticated. One change is the playing fields. Communities realized there was money to be made by building mega-sports complexes and they built them and the teams came. I know from my days at the ice rink that you have to keep the facilities filled to keep them going. You need money to pay them off and maintain them. There are volunteers to work in the snack bars, someone to clean the bathrooms, someone to manage the scheduling. Tournaments are a boon to the American economy. You haven’t traveled until you’re in a hotel/motel with a team of kids sharing the facility. Family vacations are planned around tournaments or are part of the tournament weekend. If you’re lucky, you can see a bit of the city where you are playing. 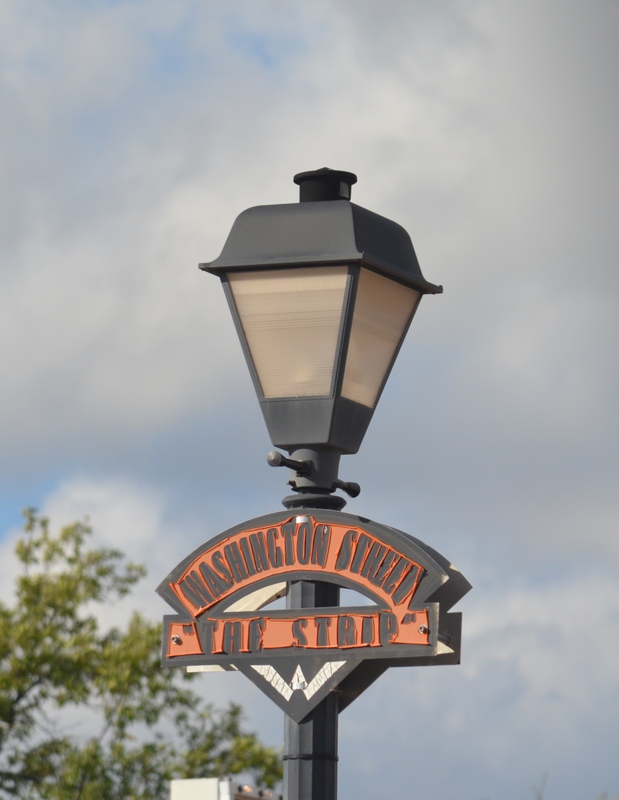 Throw some history or culture into the mix if you have time between trips to the fields. Don’t think I’m being critical. I wouldn’t dare, because I was a part of this for my kids and they want even better for their kids and so it goes. I love watching the families at all the games. I love the parents dressed in their fan gear. I love the younger siblings playing in the dirt. 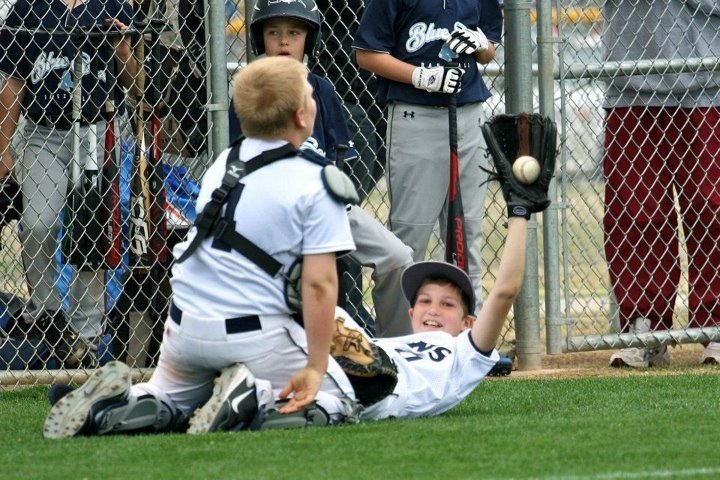 I like watching the young teammates, who always adopt a look of their own, just as they did when my kids played. They know all the catch phrases and mimic the pros as they high five and yell popular chants. There is a camaraderie between the parents and they encourage the kids. There is some murmuring when a kid isn’t playing up to the high standards, but there is mostly a warm feeling. As it’s always been, coaches are critical. Since my own childhood, I’ve seen kids drop out of a sport they love because of a coach who made the experience miserable. That still goes on. 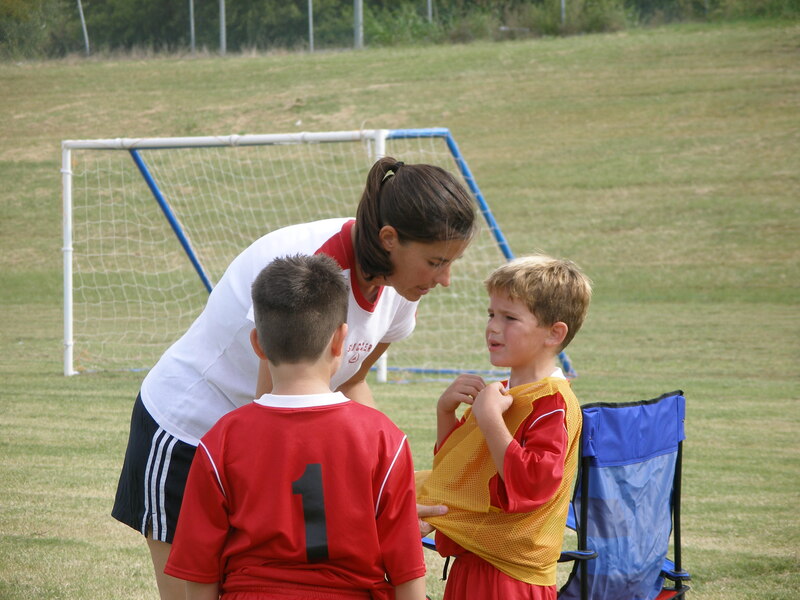 A good coach can be so important. Well, that holds true for everyone who works with kids. If we can’t inspire them to want to learn or play better or be a better person, what’s going on? We’ve all had the bad experience and it teaches us in a certain way, but there’s nothing better than a good experience. So, what’s my point? I’m not going to jump on the bandwagon and bash the parents who have devoted so very much to their children. They could certainly hover less or give fewer trophies or find time to just be together without anything organized, but they’re doing good things, too. We all make our way as parents. Even with the millions of parenting tips you get, you still have to find your own way for you and your children. A friend once told me that the only thing we really give our children is memories. That’s all the lifestyle choice we need to make when you get down to it. It can be organized or not, just make memories, good ones! As for me, I’m part of the mamarazzi, the proud grandmother taking a million pictures to remember, just as I always have. There is nothing like live football to energize you in the fall. Televised is fine, a good thing, but you can’t beat seeing it live. I’ve been to high school games since my grandson started playing. Friday night lights and all. He plays for my old high school, but it wouldn’t matter. 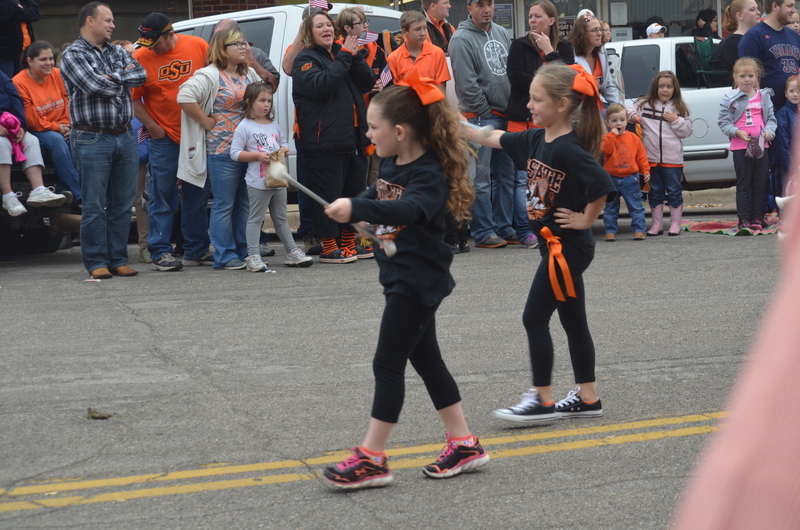 The youthful enthusiasm, the fans, the band, the cheerleaders and pom squads all make it a fun event. Some schools are more like little colleges with their recruiting and digital screens and commitment to winning at any cost, but most are just like you remember. You watch the kids milling around the stands, the parents cheering for their kids, and sing the fight songs in the cool air. Victory is sweet and defeat stings. Just like life. 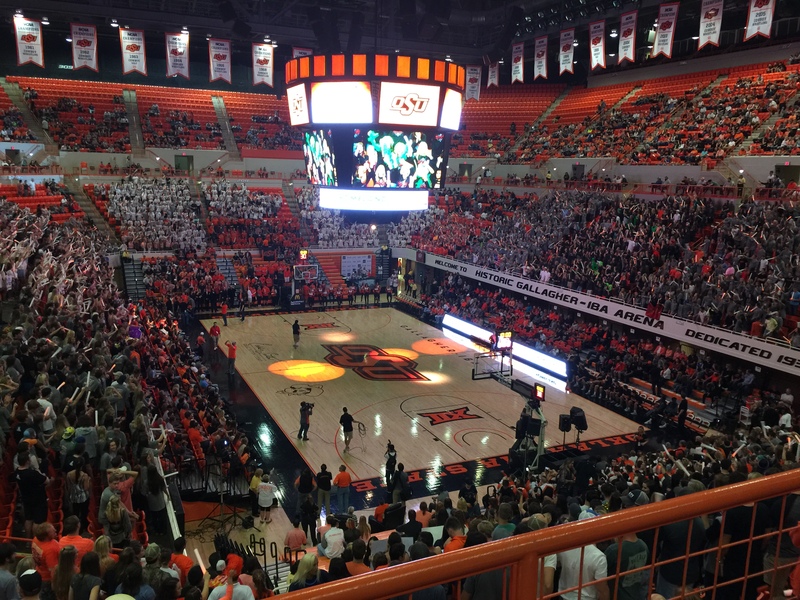 Yesterday, I went to a game at my college alma mater, Oklahoma State University. There’s nothing like college football in America. . .anywhere! Television hasn’t spoiled it, but it doesn’t show the energy that surrounds a game. There’s the tailgating, a new multi-million dollar industry from what I can see. The sophistication is amazing. There was a set up with an attached bar with barstools made of saddles under a rusted corrugated steel roof that was the tops for me. Too cool. There are big screen TVs in tents set up for the day with huge grills toted in behind pickups, custom made for game day. 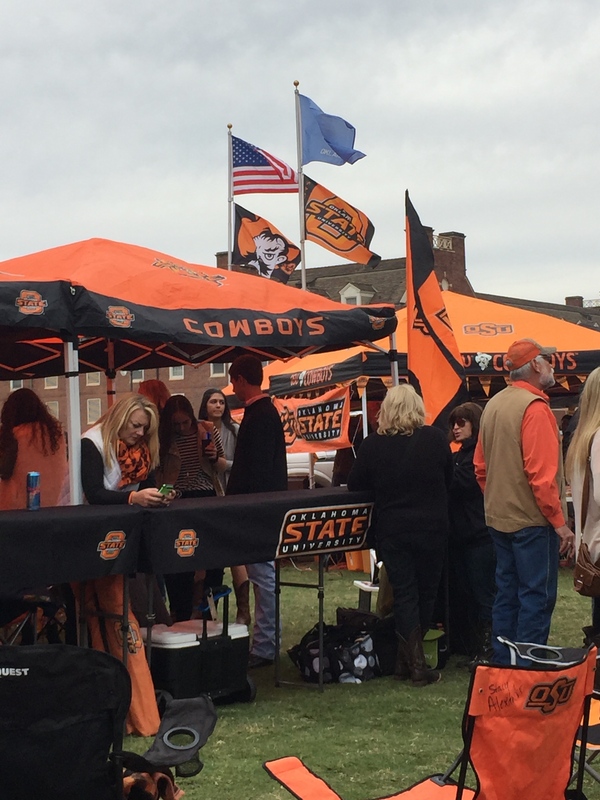 The logistics of it all are amazing, but the total devotion to tailgating is a thing of wonder. 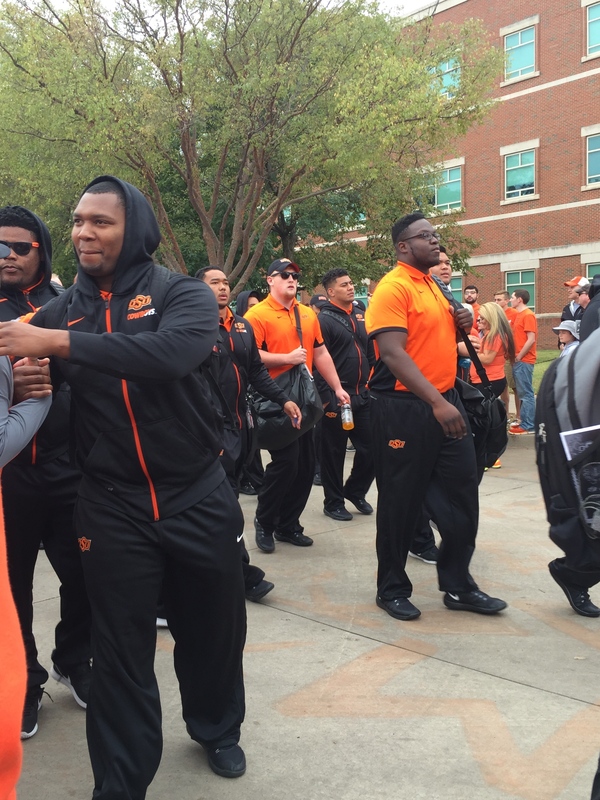 There is energy all over a college campus on game day. I think it’s because you can’t help but catch some of the scent of youth in the air, whether it’s from remembering your own college days or from watching the kids who walk where you walk. It’s unique and invigorating. What a college recruitment tool. Taking kids to the game where you are having so much fun at your alma mater has to rub off a little of your love of the school on them. Or not. We all know kids will do what they want to do, we just hope they love what we love a little bit. 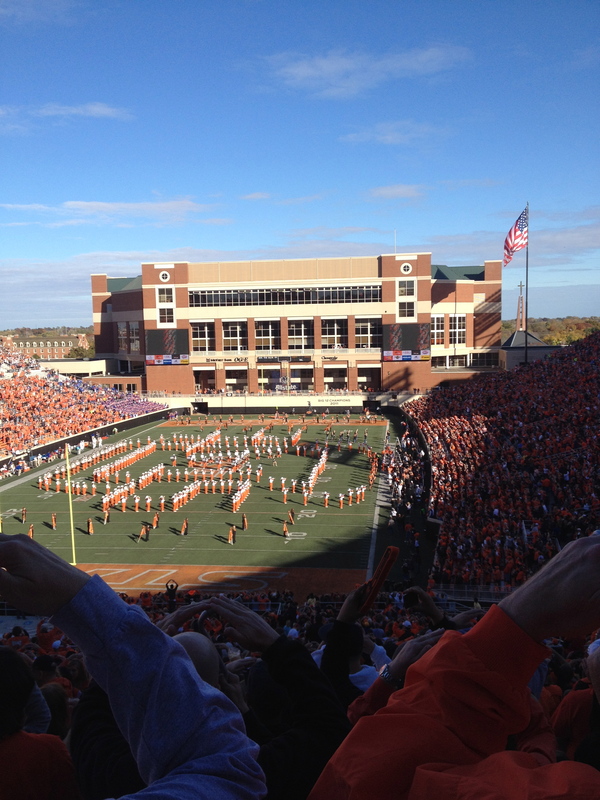 Inside a stadium during a college game, you are treated to all the university’s traditions throughout the day. The colors, the band, the fight songs and cheers, the music, the cheerleaders, pom squad, mascot, alums and students all add up to an atmosphere of love and loyalty. Sure, there are more breaks while the networks air their commercials, but the fans are treated to performances on the field. The cheers and moans are not felt through the TV screen, the half-time activities are cut for commercials and long analysis from wordy commentators who have to fill air time. It’s a whole different experience being there. In this modern football setting, you get replays at the game and updates from other games and people check their phones to see what else is going on in the world, the real world and the football world. You aren’t in your easy chair at home with the ready snacks and ability to switch from game to game. Even if you’re watching with friends, there is still something missing that you can only get live. We fortunate ones live in a world of ease of getting our entertainment when and where we want it. It’s great and all that. But there’s nothing like going to a live football game. There’s nothing like approaching the stadium and the campus and having memories sweep over you or just feeling the excitement. There’s nothing like it. So American in all the best ways. We do know how to have fun, don’t we? The World Series is on this week and my mind flashed back to baseball through my years, a zig-zag view of the sport. When I was a kid, we played baseball all the time, mostly a version of workup with whoever was available in the neighborhood. My brother played on a team, but it was different. We all didn’t go to every game, sometimes the coach piled the kids in his car to drive somewhere, they went for ice cream after games, there were no trophies unless you won something really big, like a whole season. Kids just played baseball and dads coached. I guess there were leagues for the ones who were really good, but I don’t remember much about those. The World Series was a big deal. Countless friends of mine remember teachers setting a radio in the window of the classroom so the kids could listen to the series, which were mostly played during the day. We sat quietly at our desks, listening to the sounds of the game. I loved the Yankees because of Mickey Mantle. I don’t think I knew he was from Oklahoma, but who was more baseball than Mickey? Years later, my father played golf with him and I was impressed. I’m still impressed even knowing his life’s ups and downs. I have a cat named Mickey because he swats with both paws, a switch-hitter like the Mick. Baseball was always around, but I was doing different things until my kids were in high school. One of my daughters played softball in high school and I learned to keep score, definitely an insight into the game and all its intricacies. 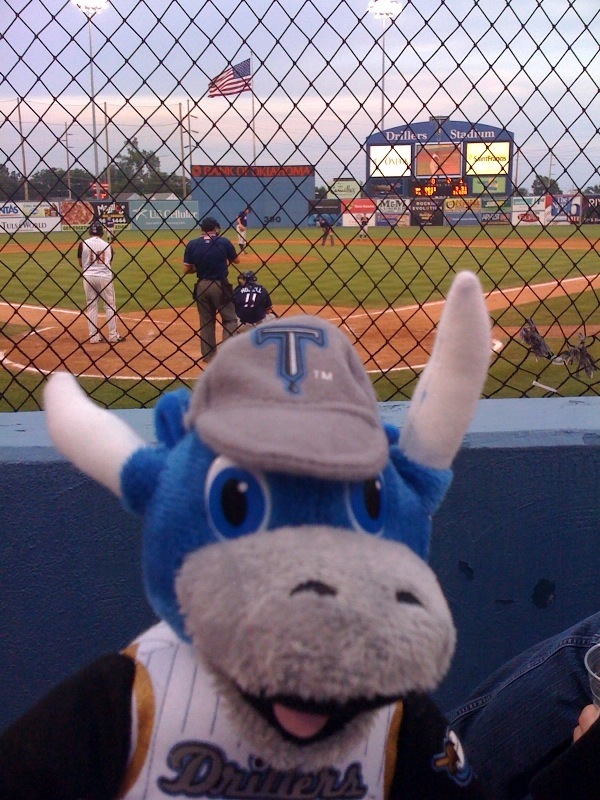 I didn’t really get back into it until my husband got season tickets to our local AA team and we became fans, real fans. Our seats were in the second row behind home plate and we would go early to watch them line the fields, watch the team warm up. It was a place where we lived in a different world with friends who sat around us, player’s wives, scouts, kids all over the place. It was a world of what we want the real world to be. There were no outside worries at the ballpark. You ate your hot dog and cheered for your team. I love AA ball because you are watching kids who are on the verge of making it big. Some of them did and it was fun to watch them move on to the big leagues. Some of them played minor league ball for a long time and finally had to move along. That life of little pay, long bus rides, motels and time from your family isn’t always fun no matter how much you love the game. We kept those tickets for 19 years, after my husband died, after the kids all had kids. The family went together, we loved the mascot, we watched fireworks, we played the games outside the field, one of my grandsons went to the player clinic. Many happy family memories at the ballpark. We finally gave them up when the team moved to a nicer stadium. It wasn’t because we lost interest in the game, but because we had our own ballplayers now and too many games to watch to make all the big games. We still love them…we just pick and choose our games. I never saw a major league game in person until a visit to Denver in 2010 where we watched the Rockies play the Cubs, my son-in-law’s favorite team. 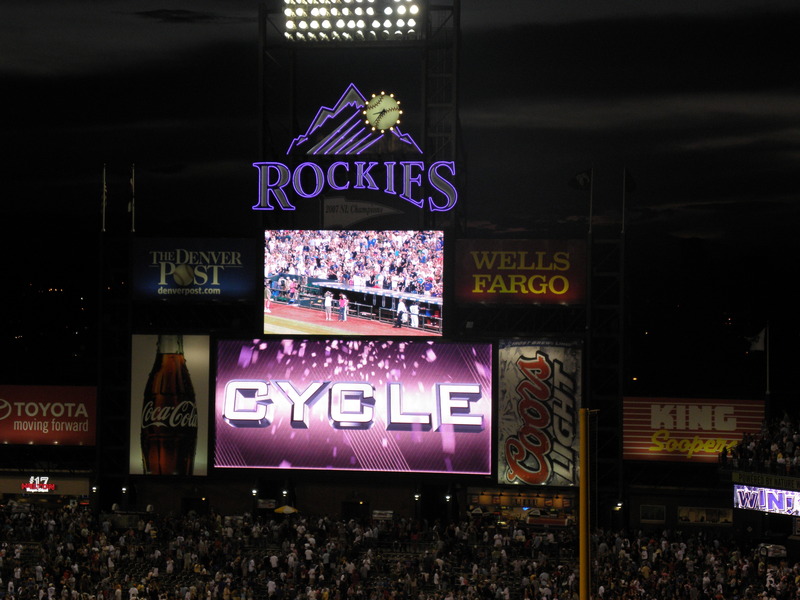 It was a treat, a special game in beautiful Coors Stadium but not quite as intimate as our home AA field. There’s something nice about watching kids who are trying to make the dream that can beat out multi-million dollar players for winning your heart. I do love the game. I watched Ken Burn’s series, “Baseball,” and love all the history, the symbolism. I’m not one who can throw out all the stats, but it doesn’t matter. Today, I have three grandsons playing the game, playing because they love to play. They play pretty competitively so I thought they all were trying to reach the pros. I think they’d like to play at least into college. Mostly, they just play to get better and keep playing. It’s fun to watch them, fun to watch the families who make every game on fields that are better than the pro teams played on in the game’s beginnings. Pretty good lessons in life. Sometimes you swing and hit a home run, sometimes you strike out. You run to the bases, trying to get to the next one and then you come home. There’s the glory of the win and the sting of defeat. You’re part of a team and you play together to win. All those things we’ve heard through the years.